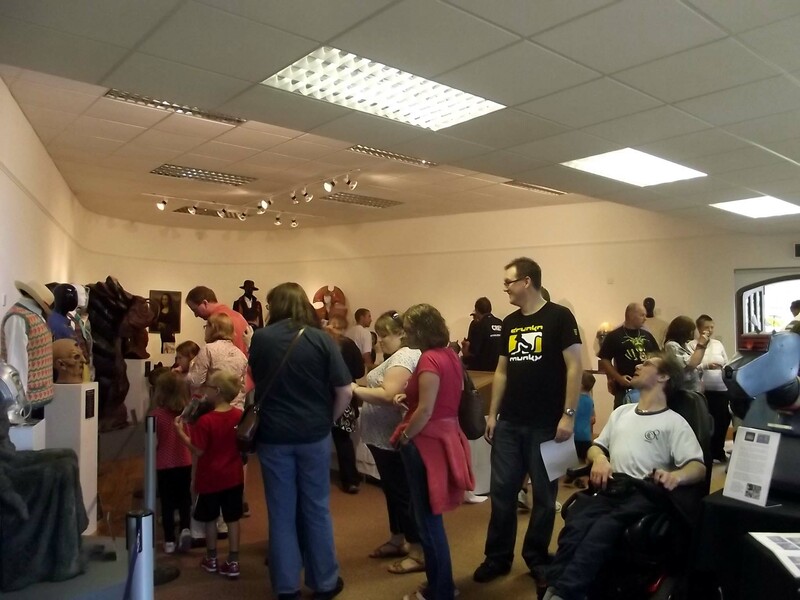 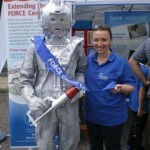 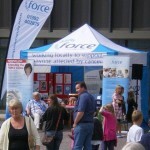 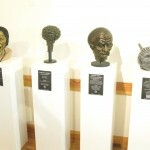 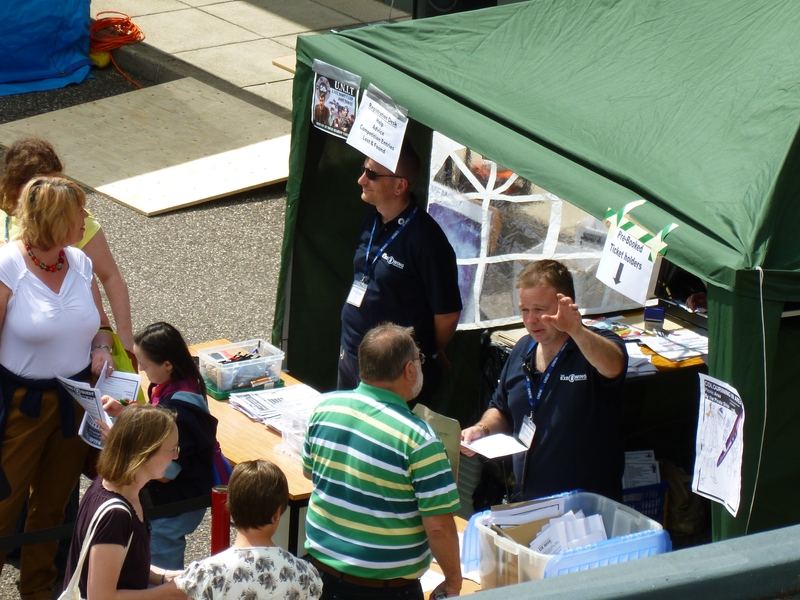 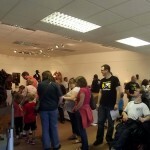 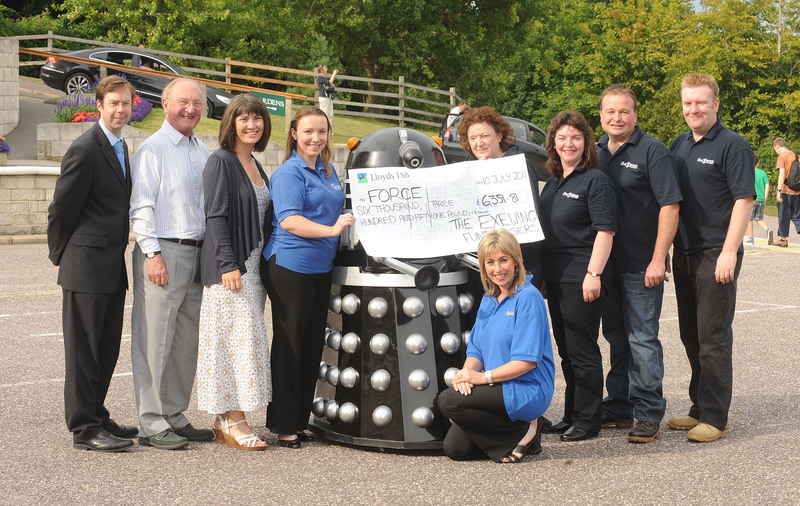 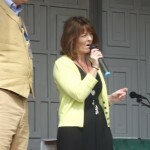 Sunday 1st July 2011 marked the return of Exewing Fundraiser’s main events. 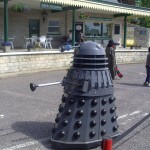 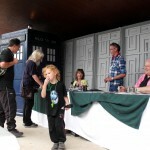 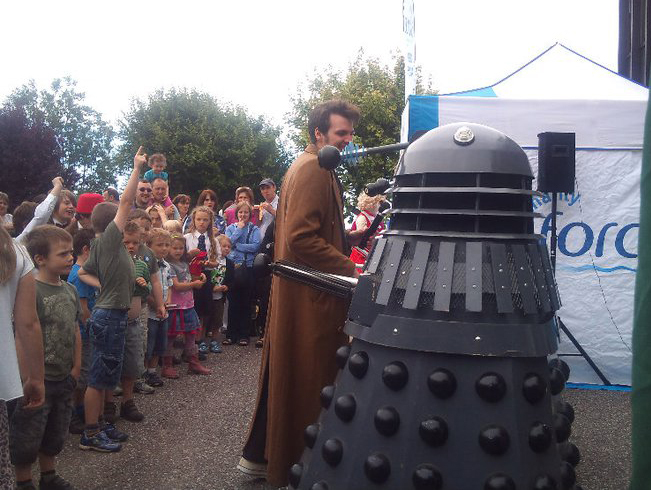 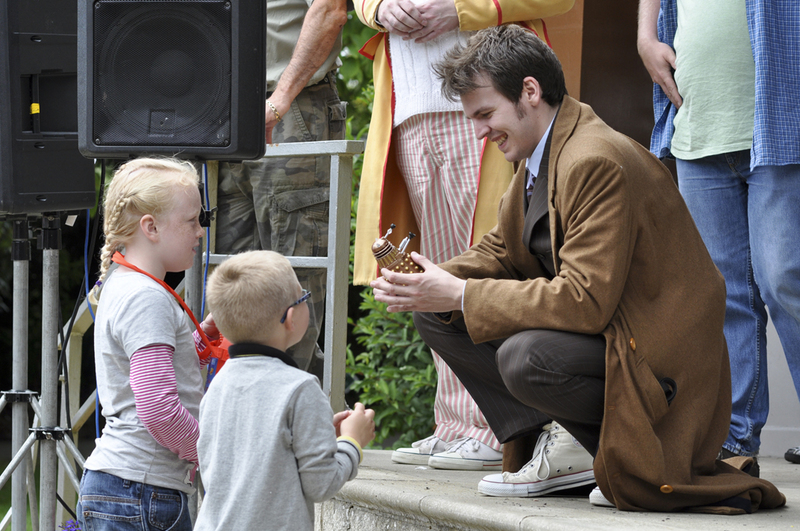 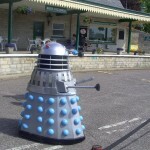 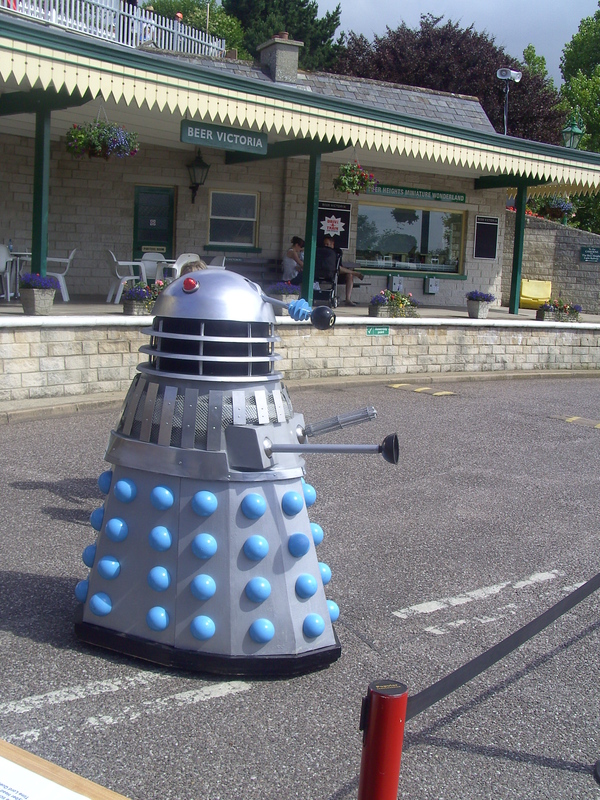 ‘Doctor Who Day One’ was a change of theme and a change of venue, after many events at the Sports Centre in Honiton it was decided to relocate, not too far away, to Pecorama, Beer, East Devon. 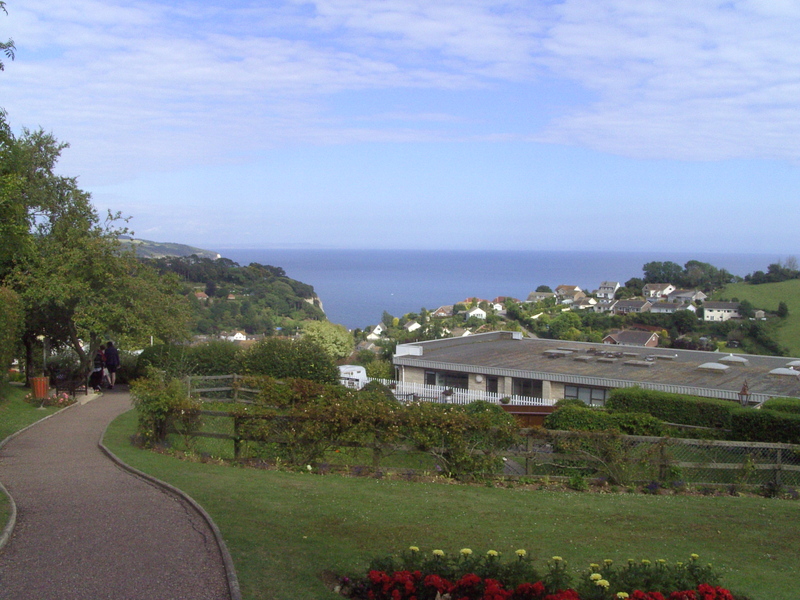 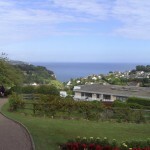 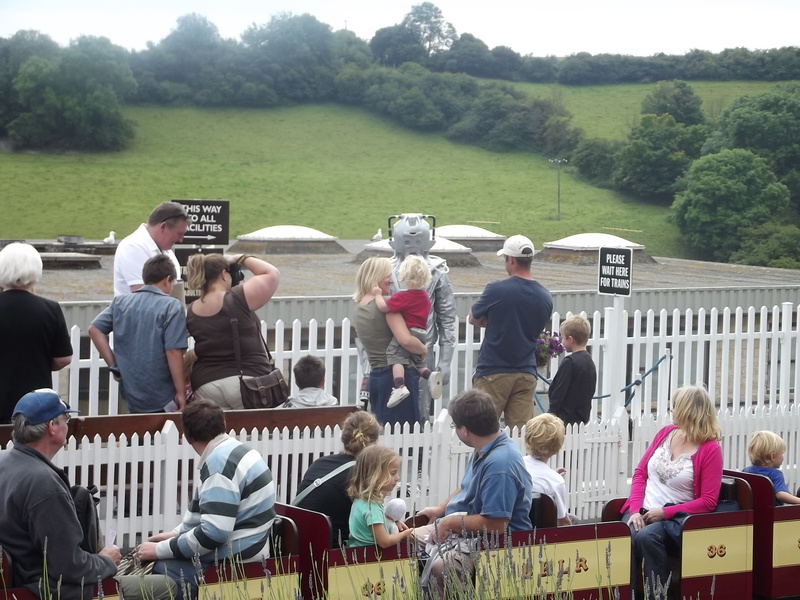 One of Devon’s premiere tourist attractions, situated on a wonderful hillside location, with stunning views, fantastic gardens, steam railway, shop, model railway exhibition and tempting eateries. 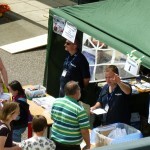 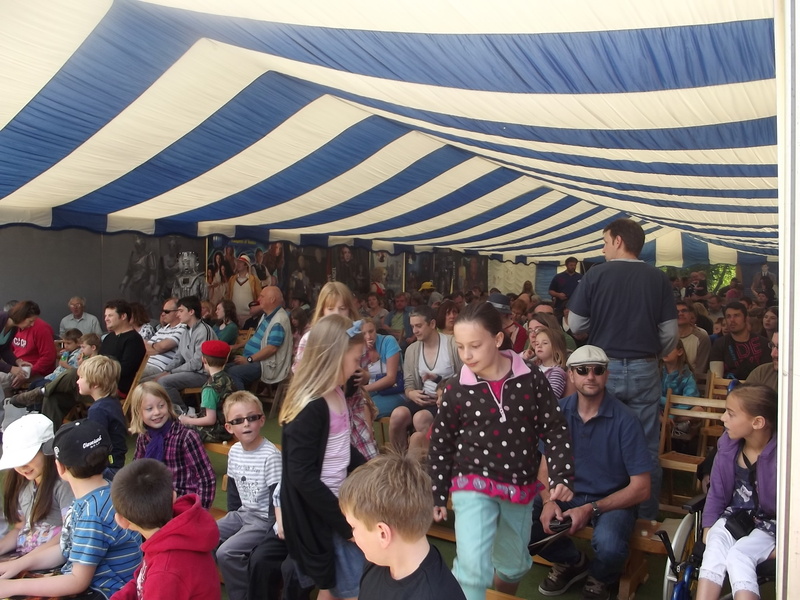 10am and a thankfully glorious sunny day greeted attendees as they arrived at Peco, over 1400 people came to see the good Doctor over the course of the day. 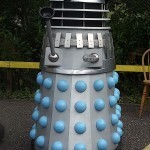 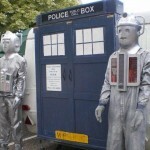 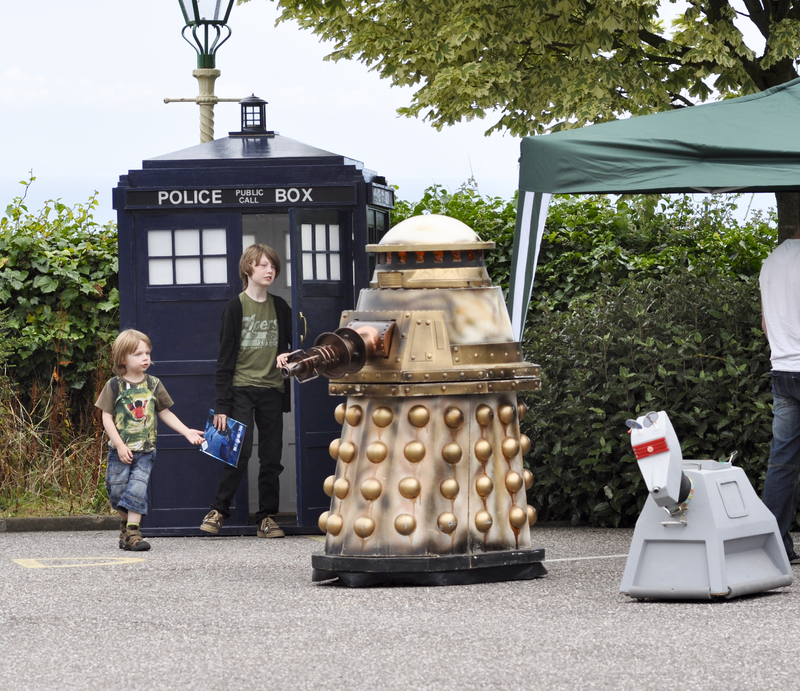 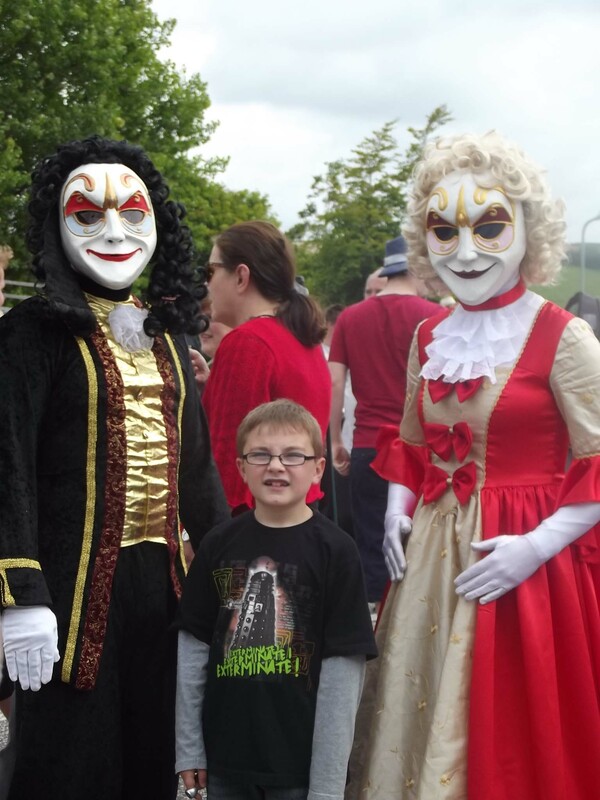 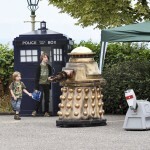 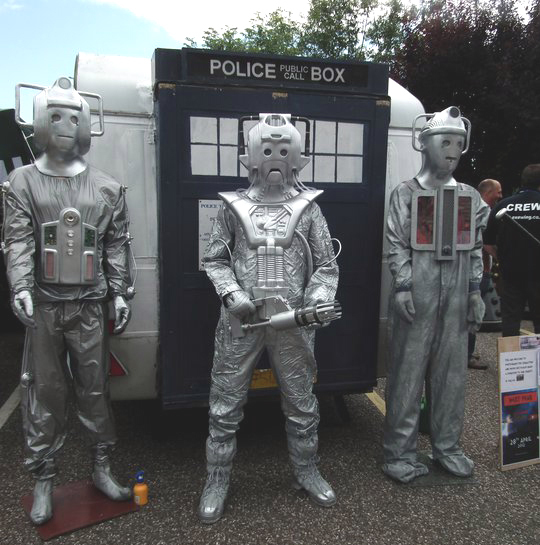 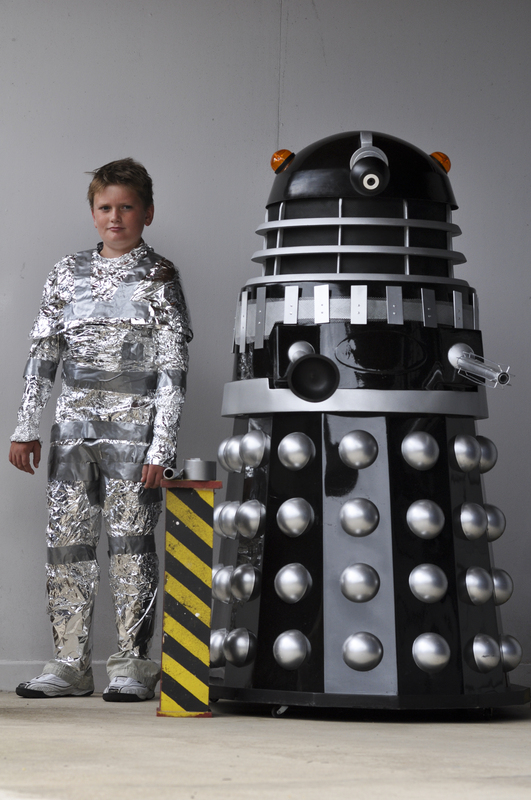 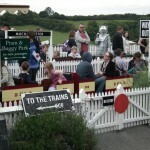 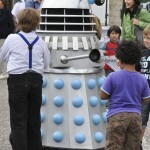 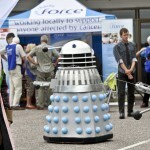 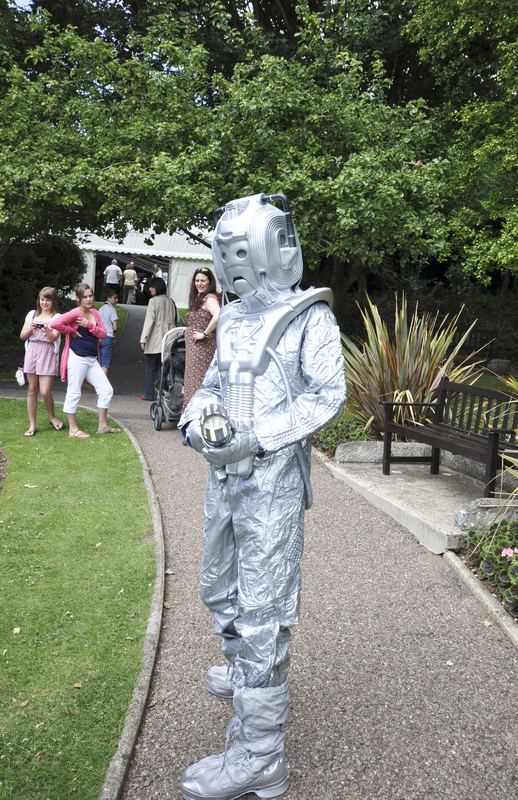 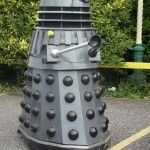 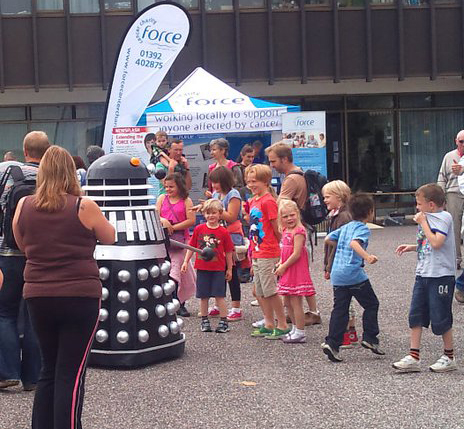 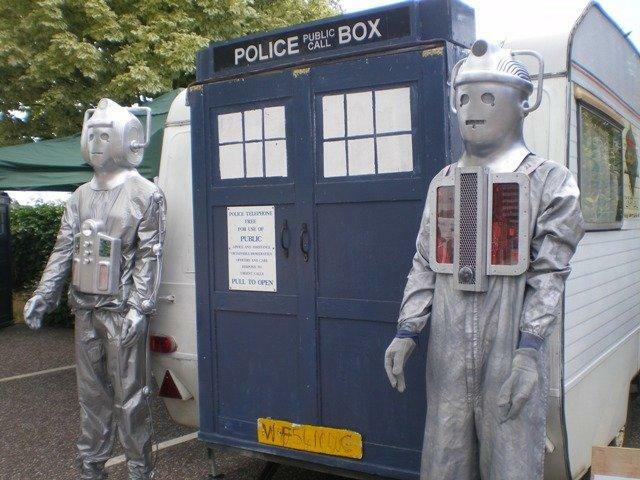 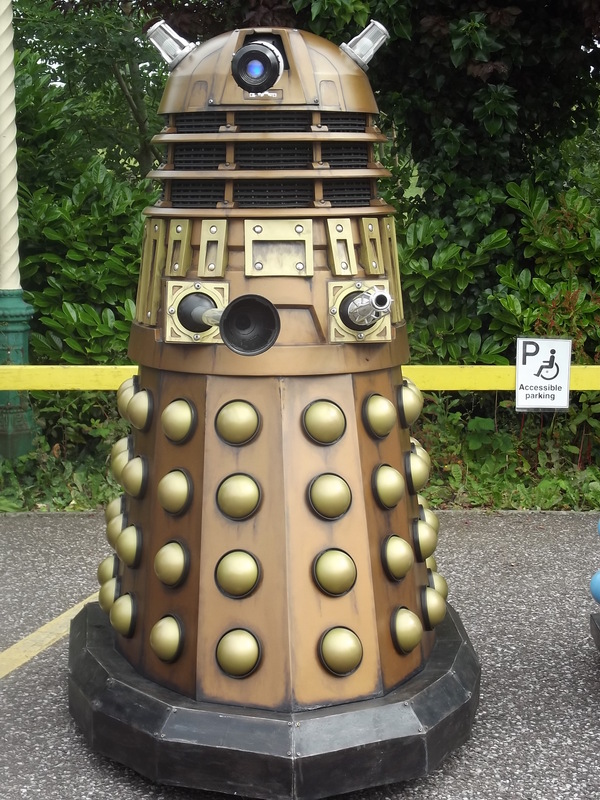 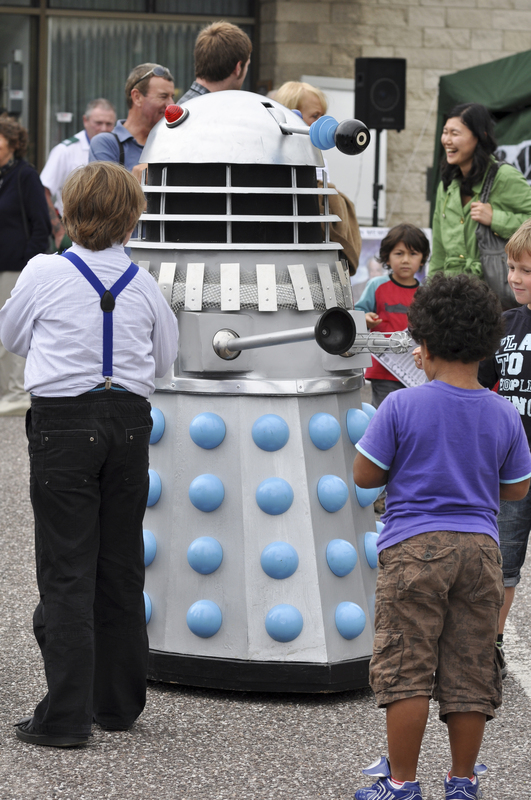 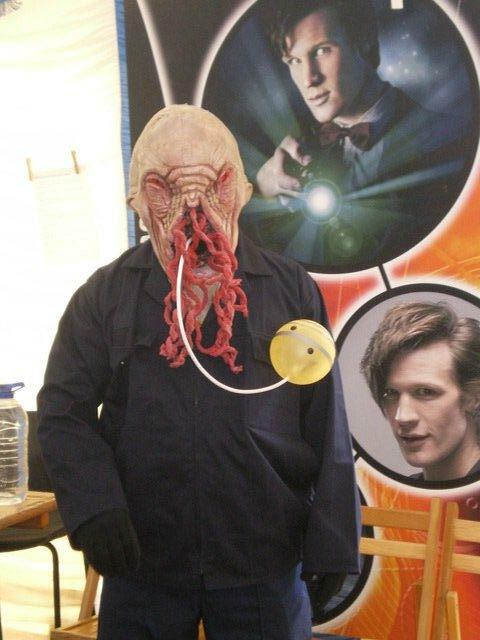 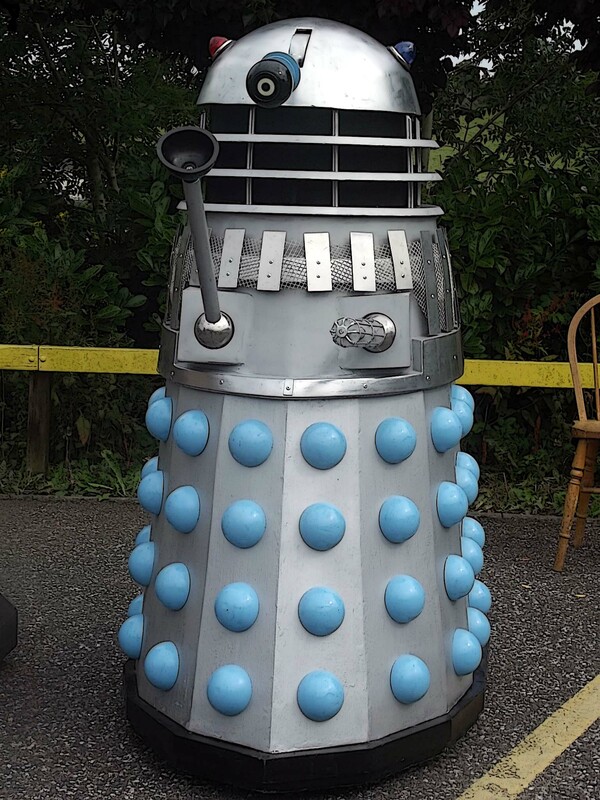 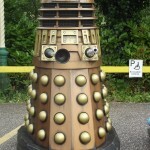 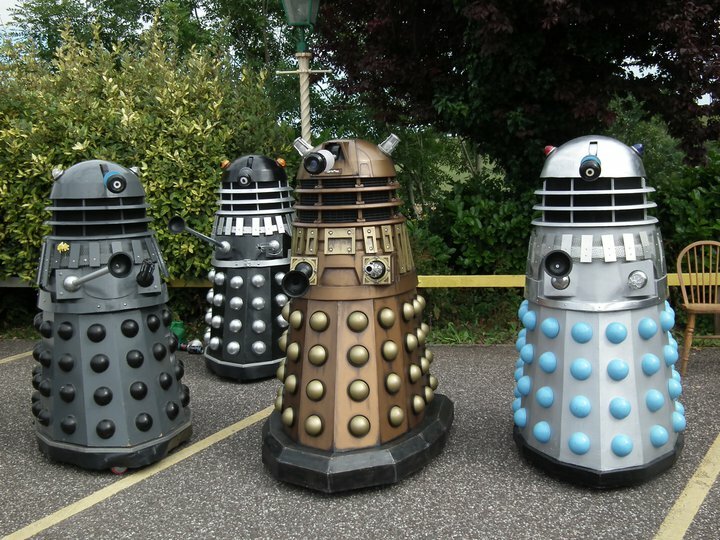 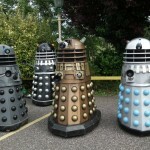 As the title implied the theme for the event was Doctor Who and a whole host of monsters and characters, including Daleks, Cybermen and Clockwork Droids, welcomed the public as they arrived. 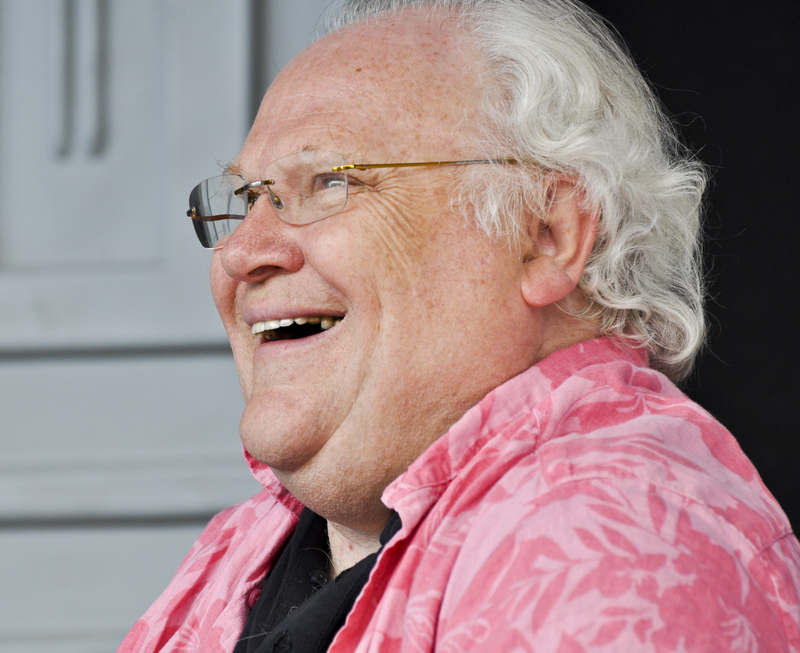 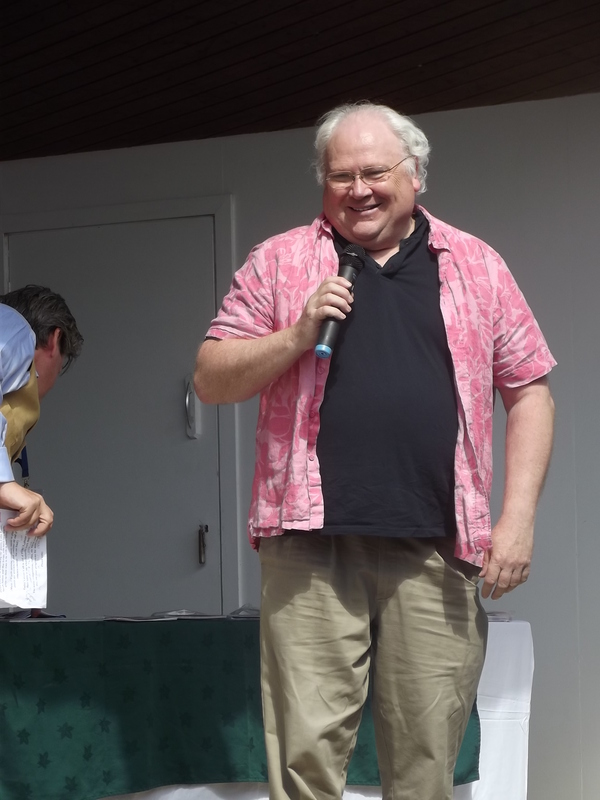 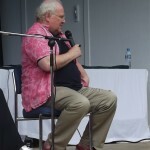 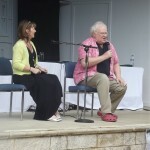 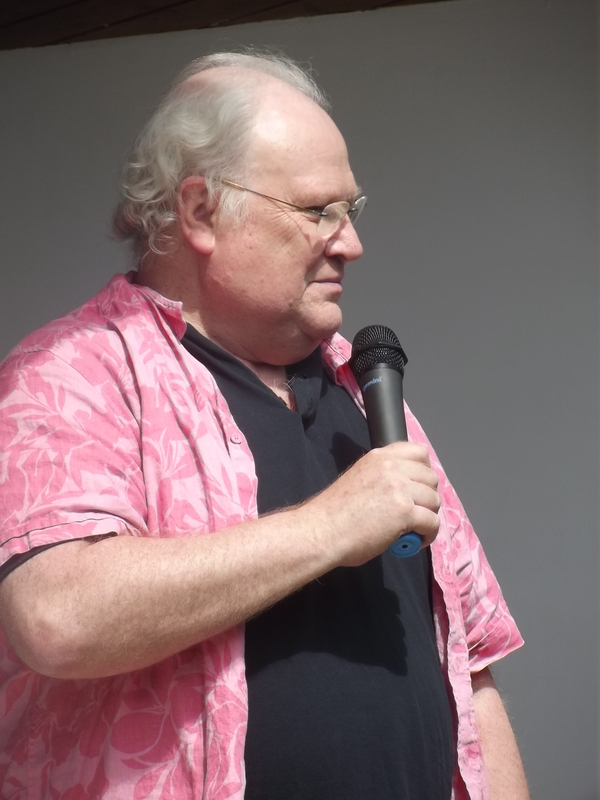 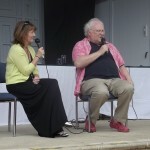 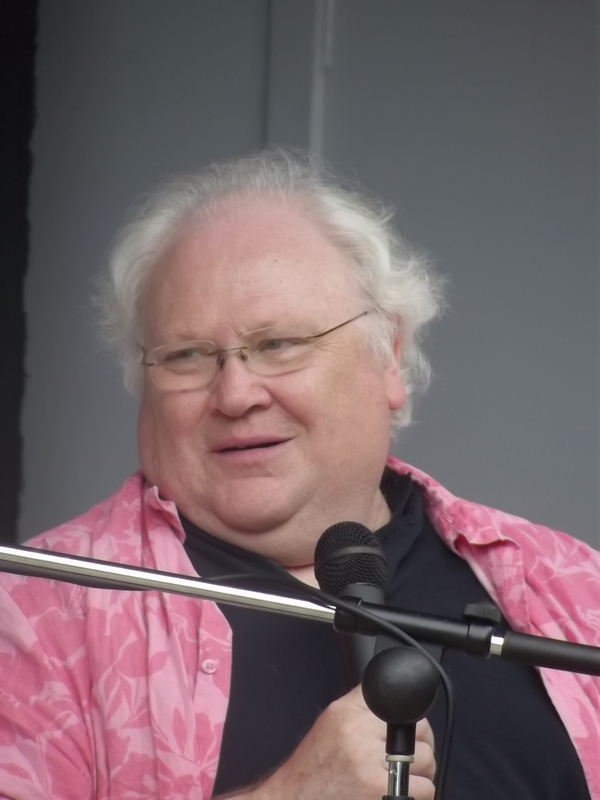 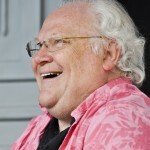 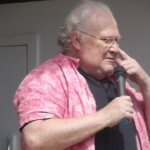 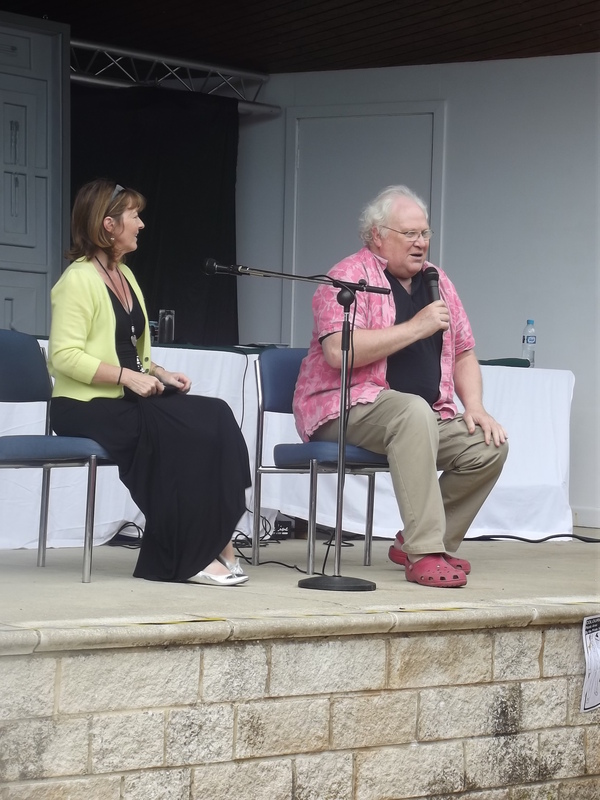 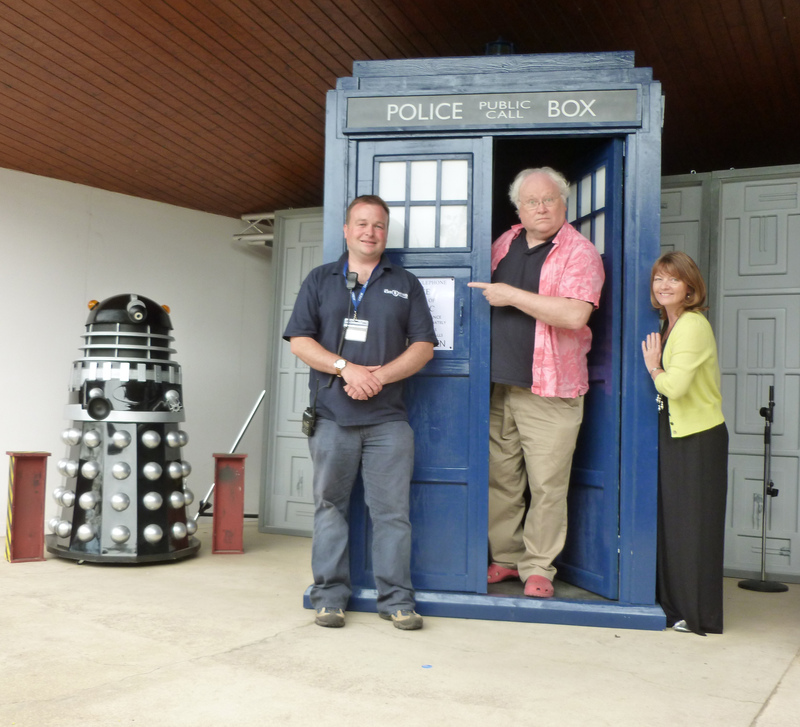 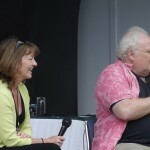 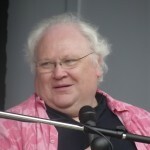 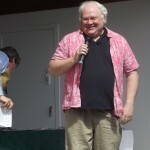 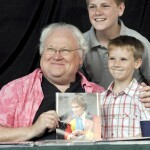 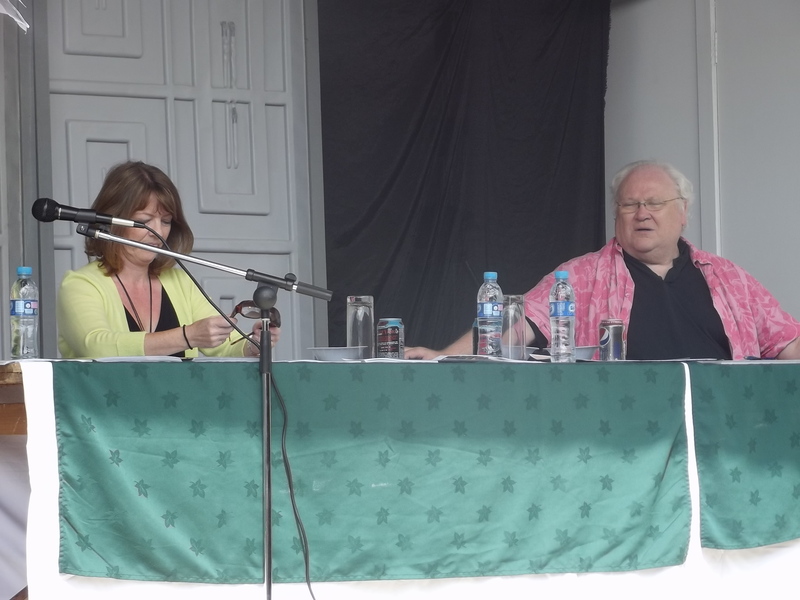 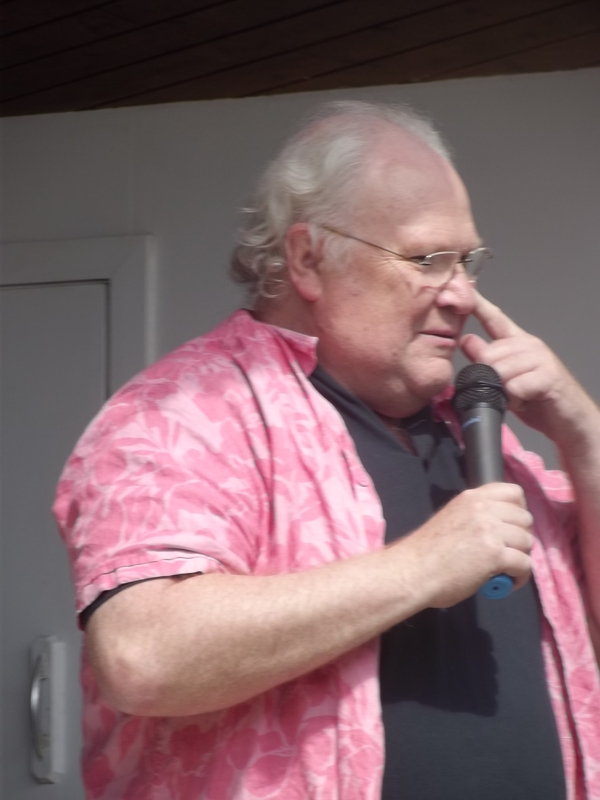 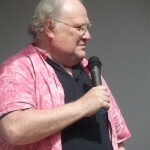 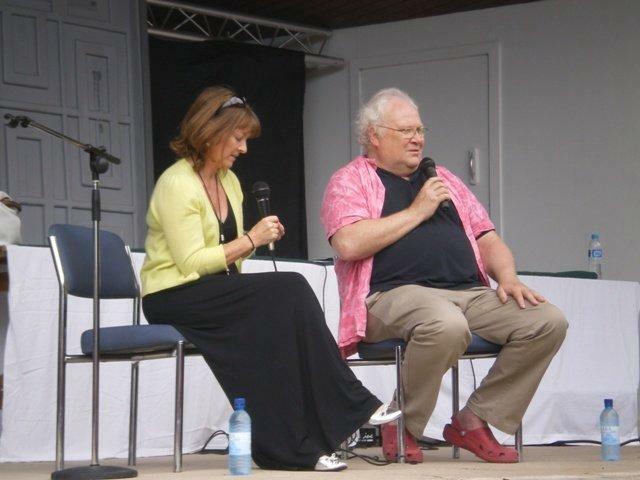 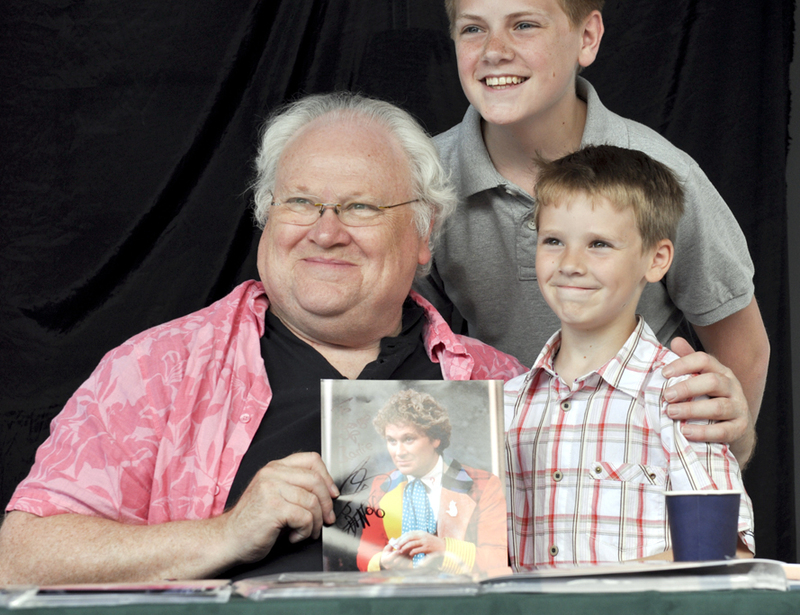 Fortunately the very special celebrity guest was Colin Baker who played the sixth incarnation of the Timelord, therefore he was well versed in dealing with these galactic terrors. 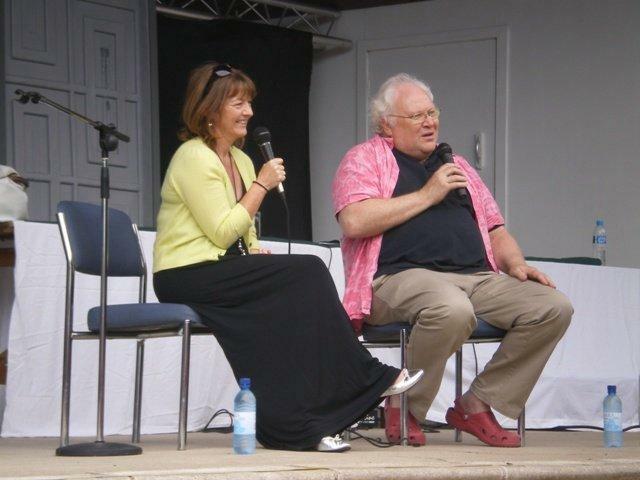 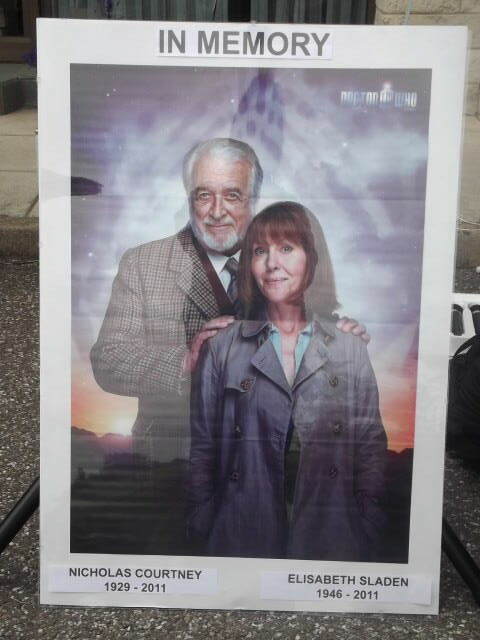 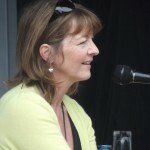 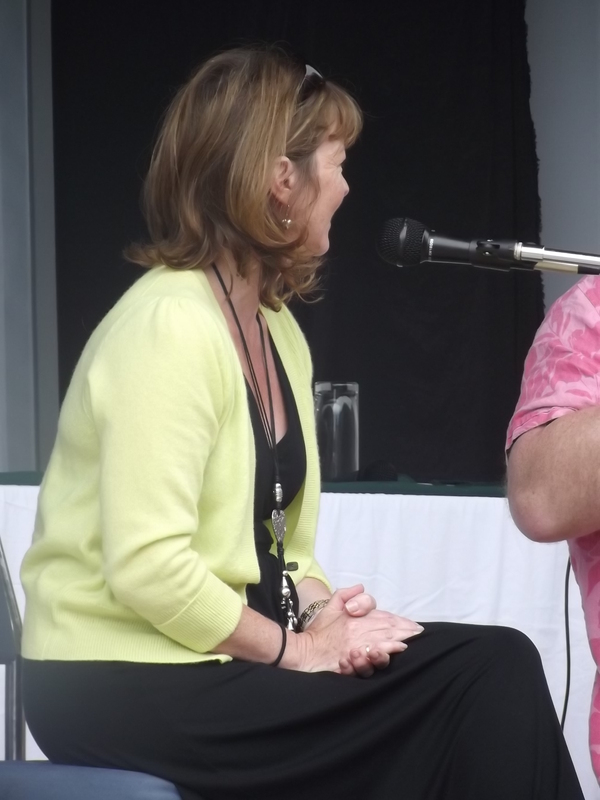 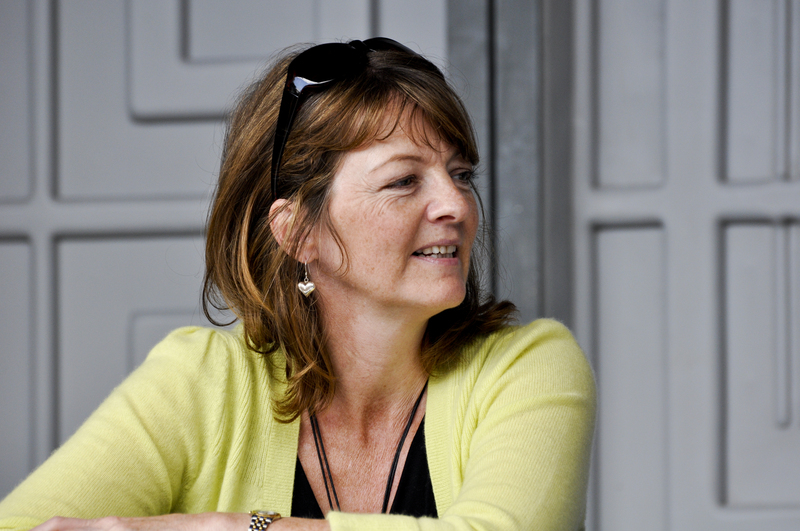 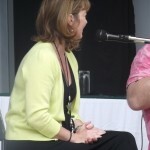 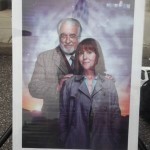 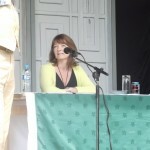 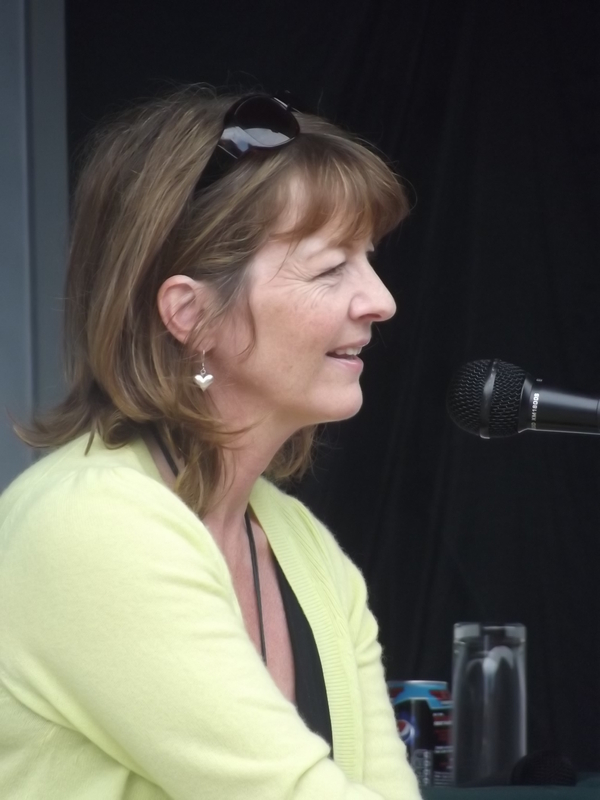 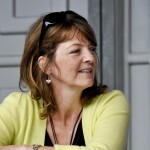 Celebrities joining Colin included Sarah Sutton who played Nyssa, companion to Peter Davison’s fifth Doctor and Mat Irvine, special effects designer. 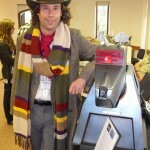 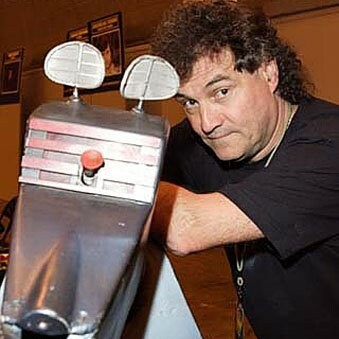 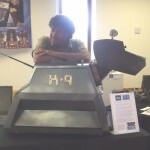 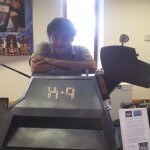 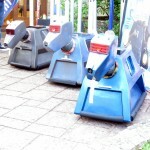 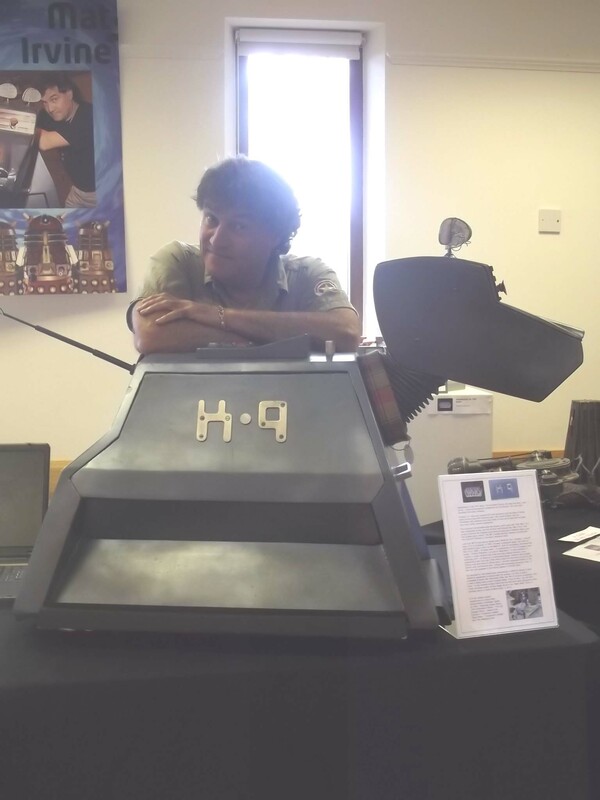 Mat brought along the original K9, the Doctors faithful mechanical dog. 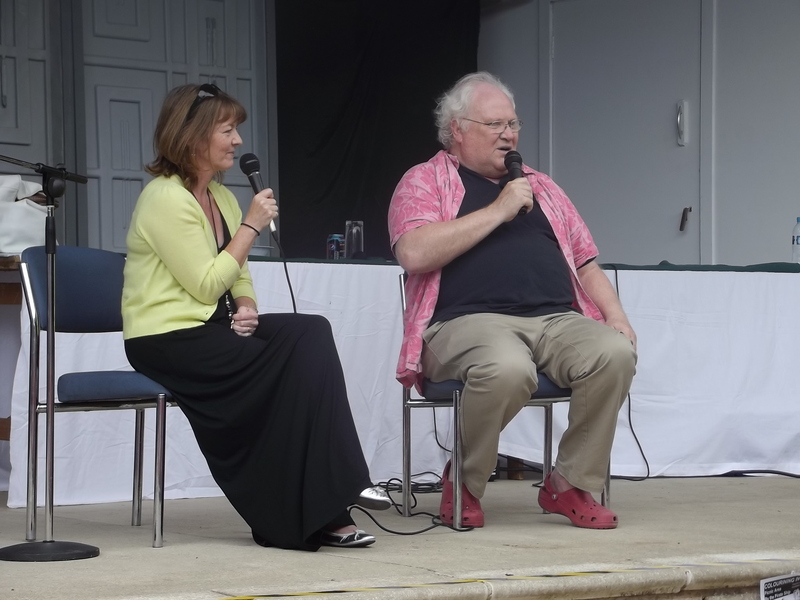 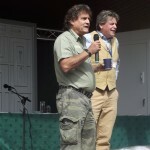 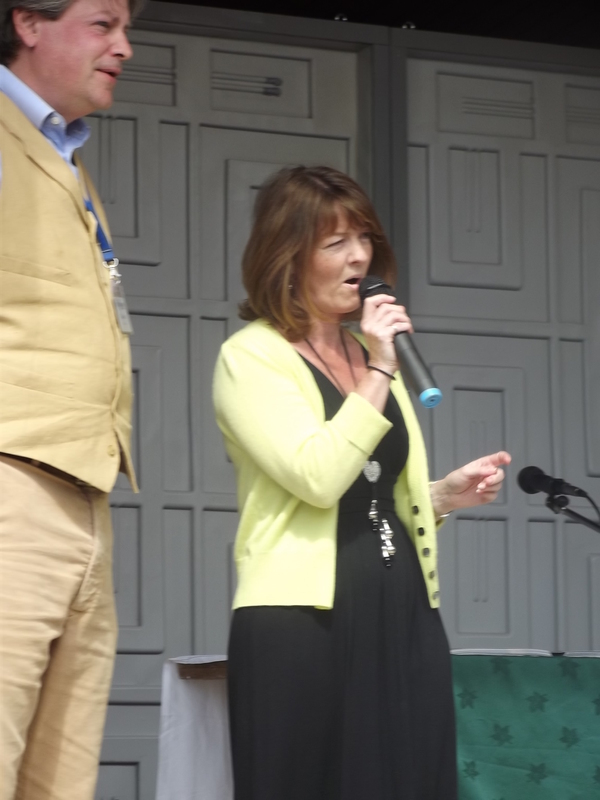 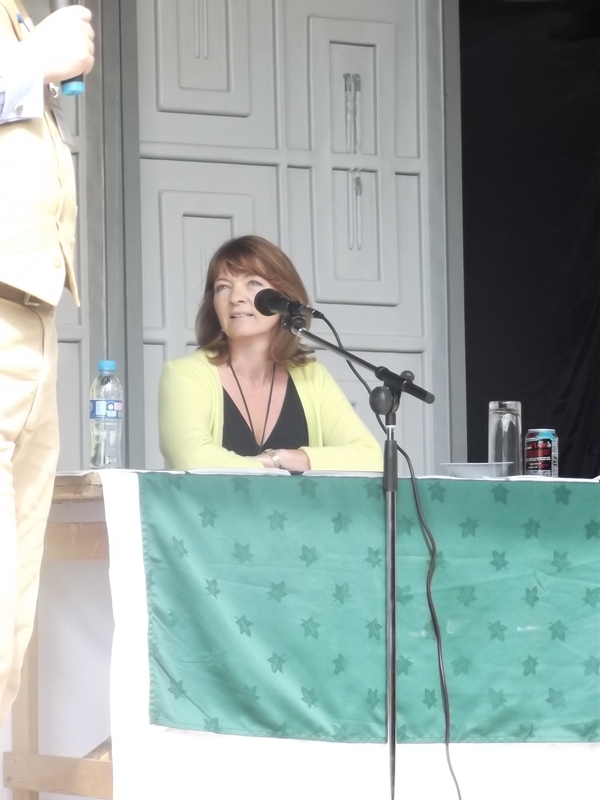 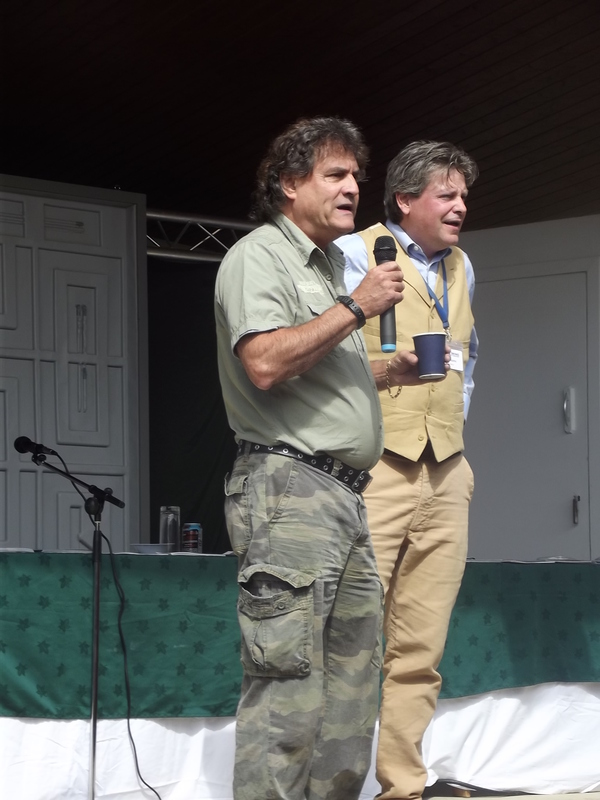 Introduced by Grahame Flynn, Colin and Sarah started the day by welcoming everyone and conducting the most charming question and answer session. 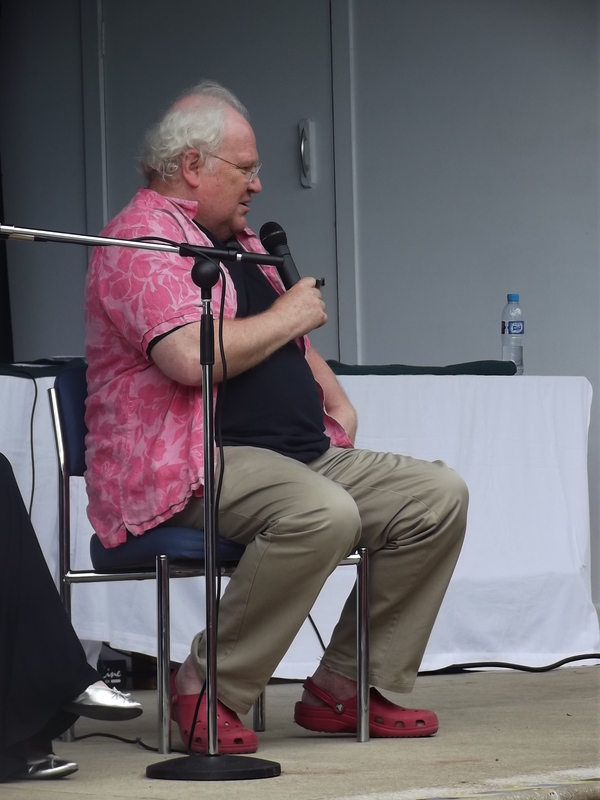 Colin, answered the question “where does the TARDIS go?” instantly with a perfectly plausible answer involving particle physics and multiple universes, which earned a round of applause. 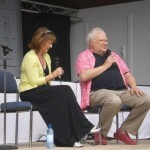 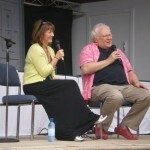 Although Sarah and Colin had not worked together on the programme there was a lovely chemistry between the two of them. 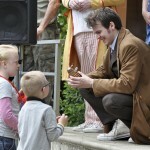 Colin also revealed that Patrick along with current Doctor Matt Smith were the two best actors in his opinion to take on the role. 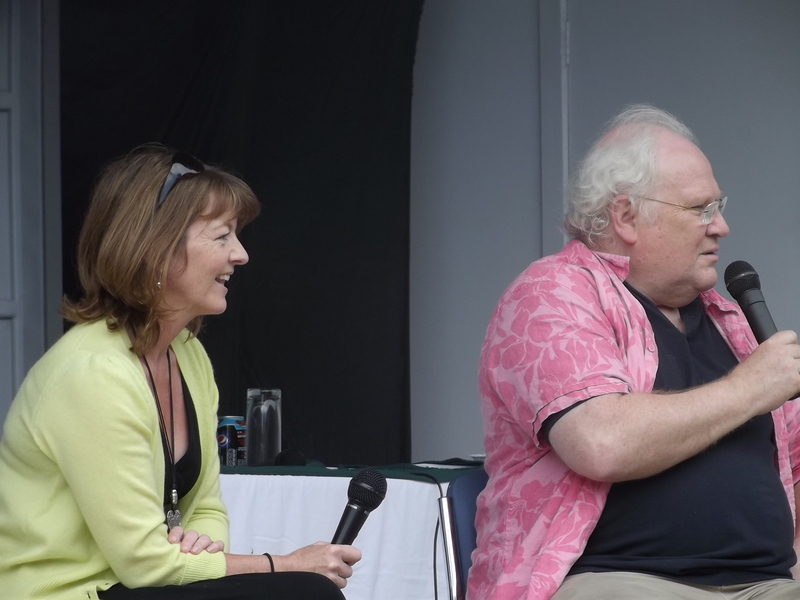 After the Q&A session there was the opportunity to get autographs, Colin and Sarah were cheerful and friendly throughout; many a smile was to be seen. 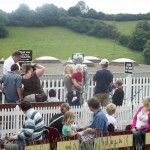 During the day there were many attractions to behold or take part in, U.N.I.T. 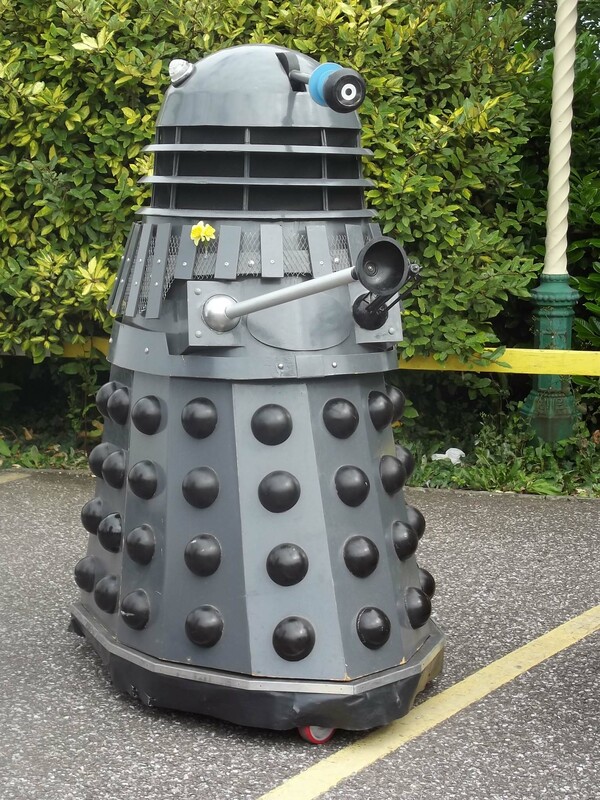 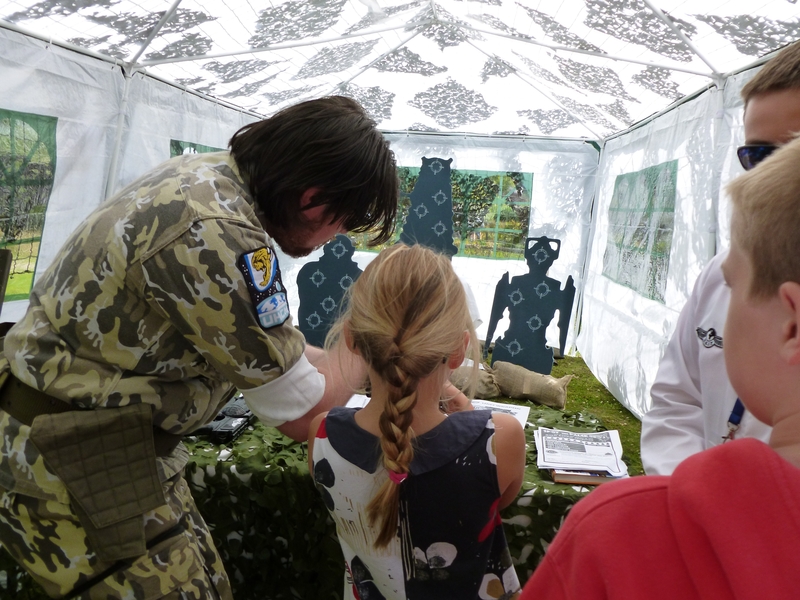 were recruiting, the Boot camp involved searching the grounds for a hidden Dalek code, a firing range challenge and an aptitude test! 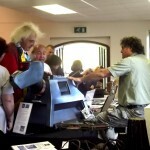 A Dealer room, which was full of essential Doctor Who memorabilia, many bargains were waiting for the happy shoppers. 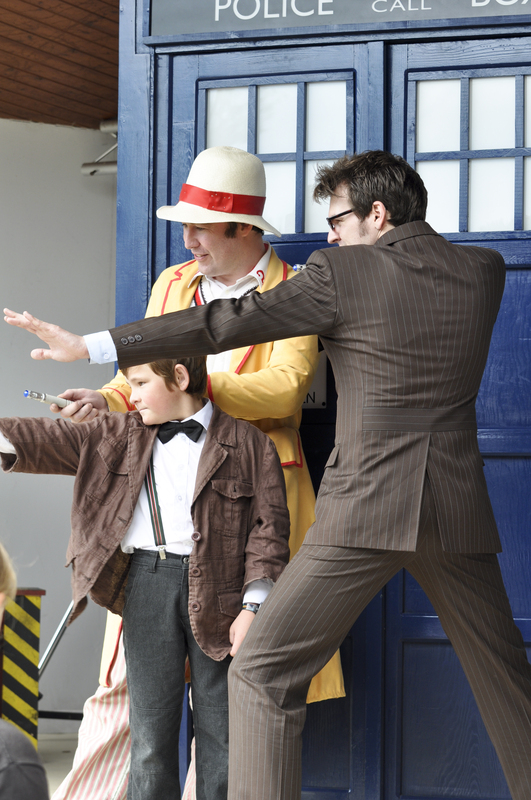 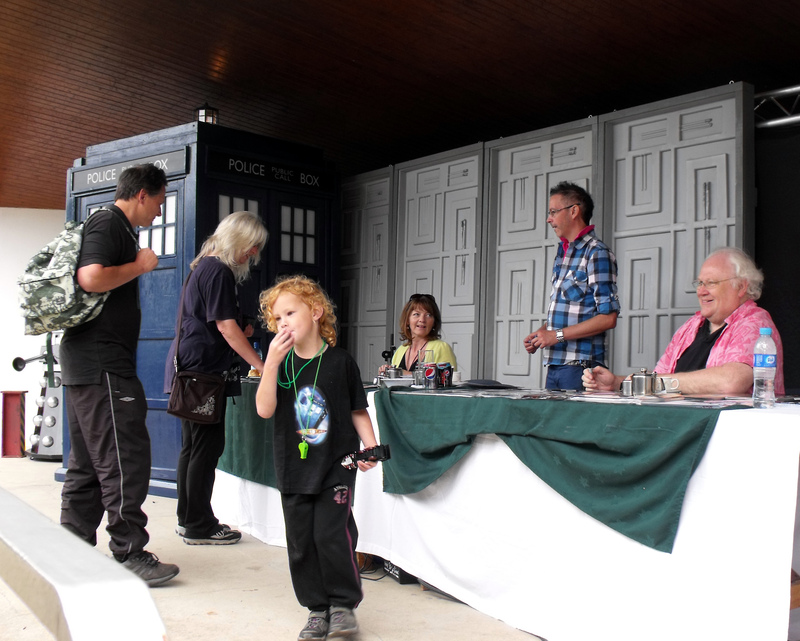 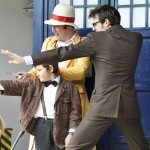 The Timelord Quest was a treasure hunt style activity, taking the intrepid explorers all over the venue looking for clues to help The Doctor solve a pressing mystery. 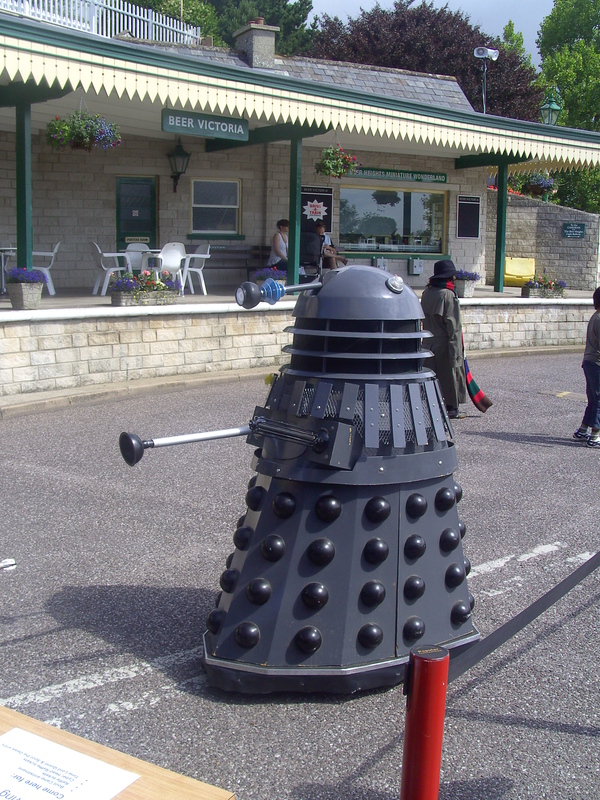 Spot the Dalek, eagle eyes were required to find all the miniature metal meanies hiding in amongst the Model Railway Exhibition. 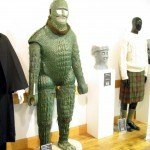 A walk in the woods has never been the same when it involves looking out for a plethora of Doctor Who monster images that were lurking there, the Monster Trail was a popular activity. 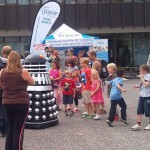 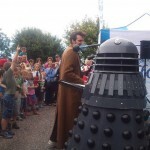 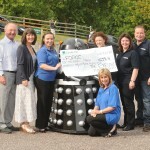 A chance to ask a Dalek a question was offered with the Audience with a Dalek. 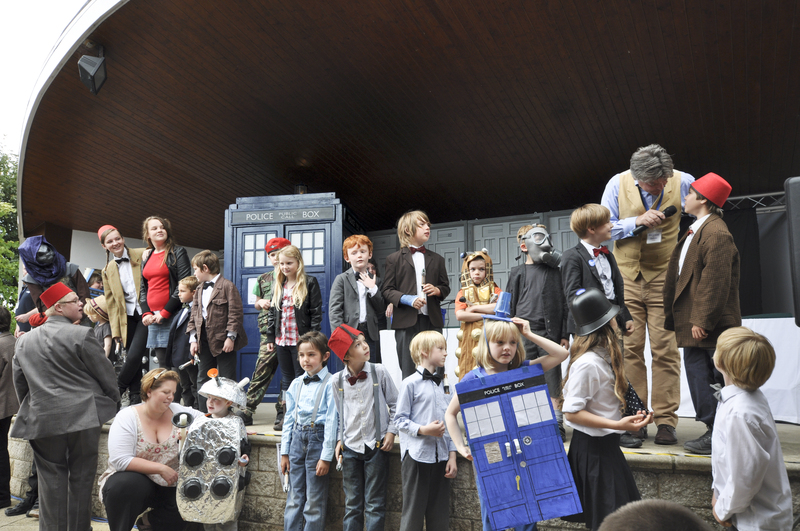 Halfway through the day there was a fancy dress competition on the main stage. 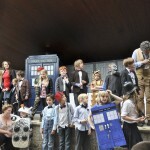 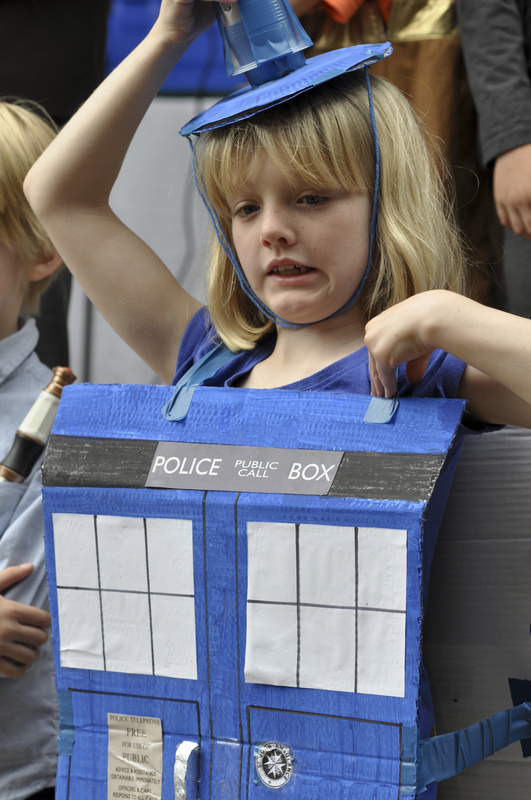 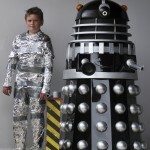 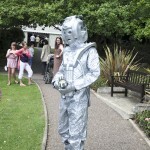 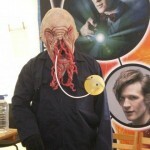 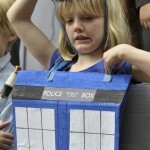 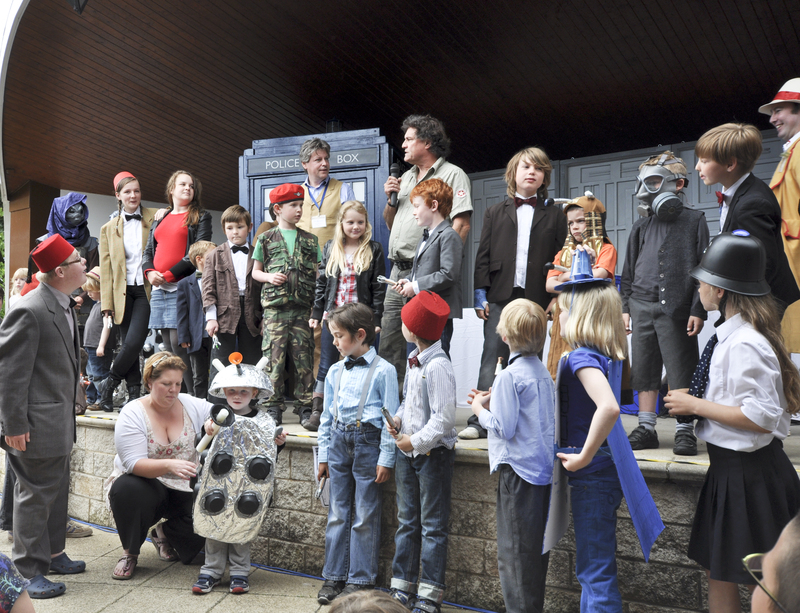 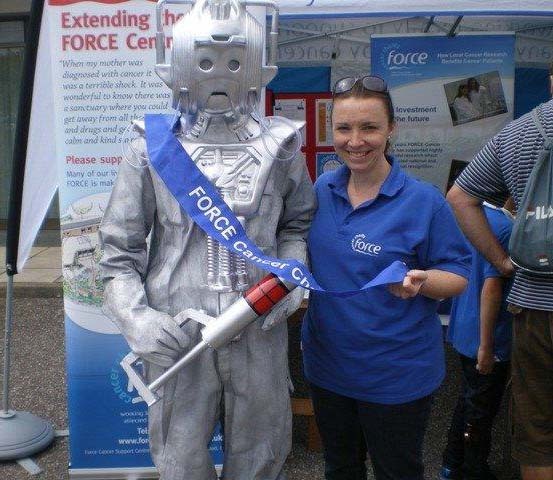 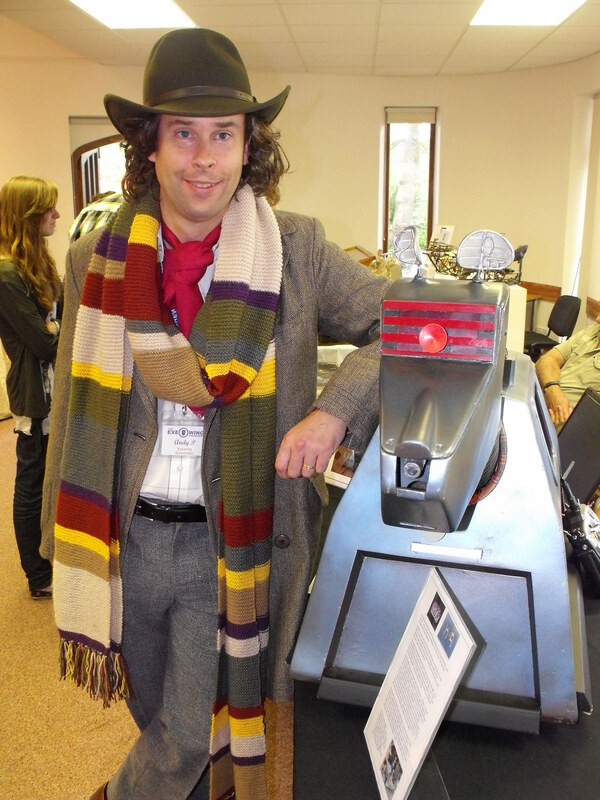 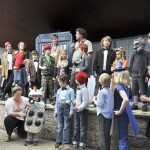 As always, the entries were all fantastic; A TARDIS costume won the day. 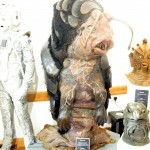 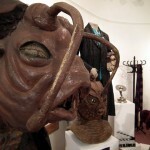 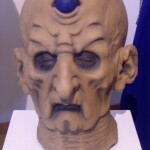 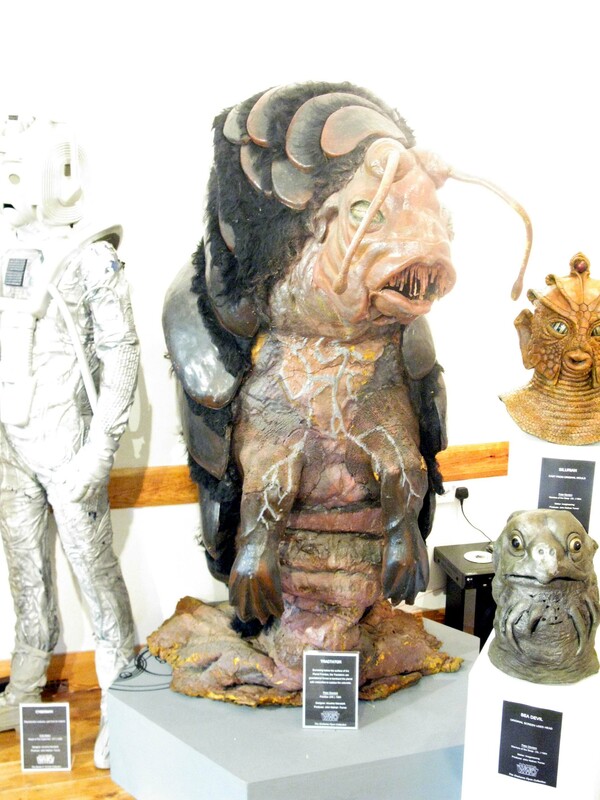 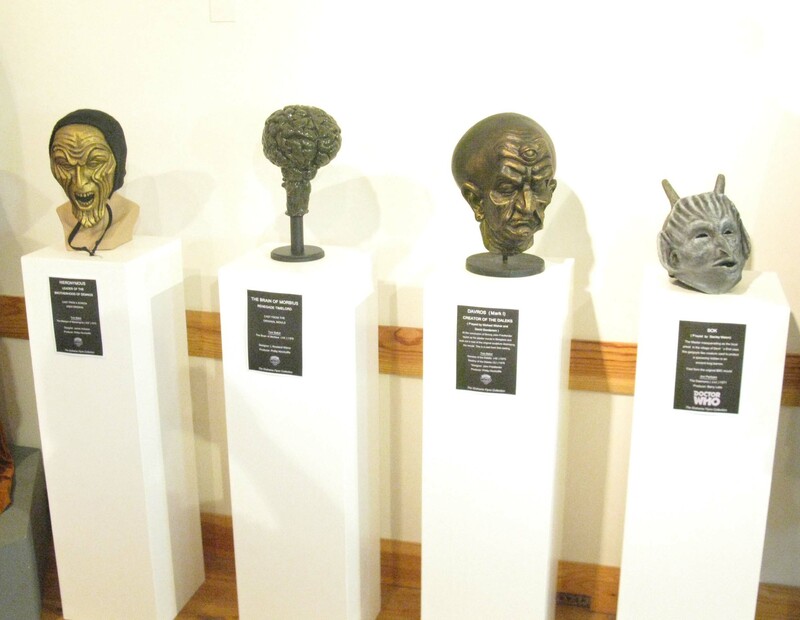 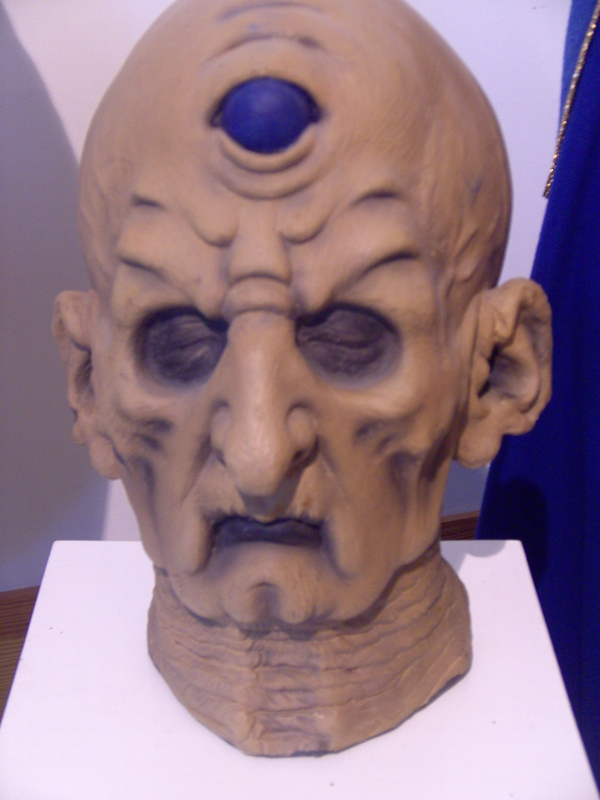 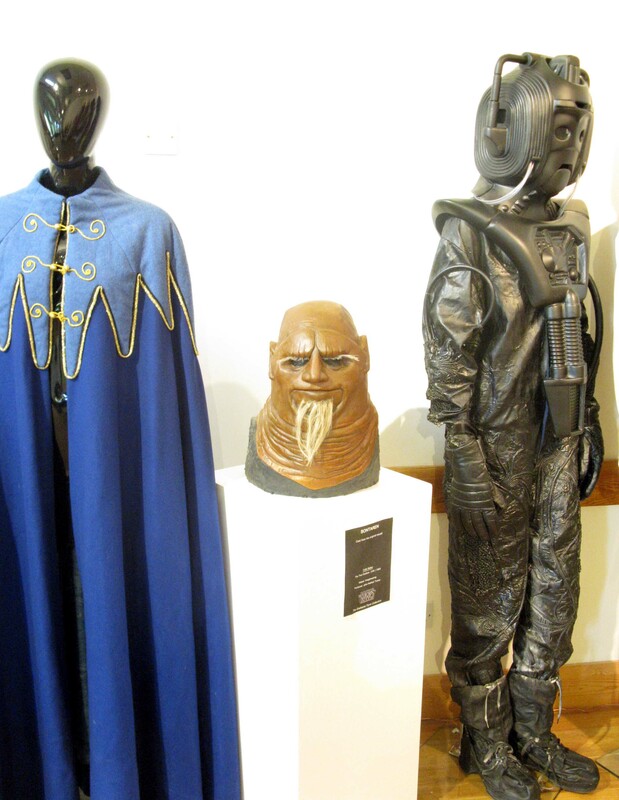 Along with Mat Irvine’s wonderful exhibits of models and props from the show, two gentleman, Grahame Flynn and Daniel O’Keefe were largely responsible for the amazing Doctor Who exhibition held in the Art Gallery building. 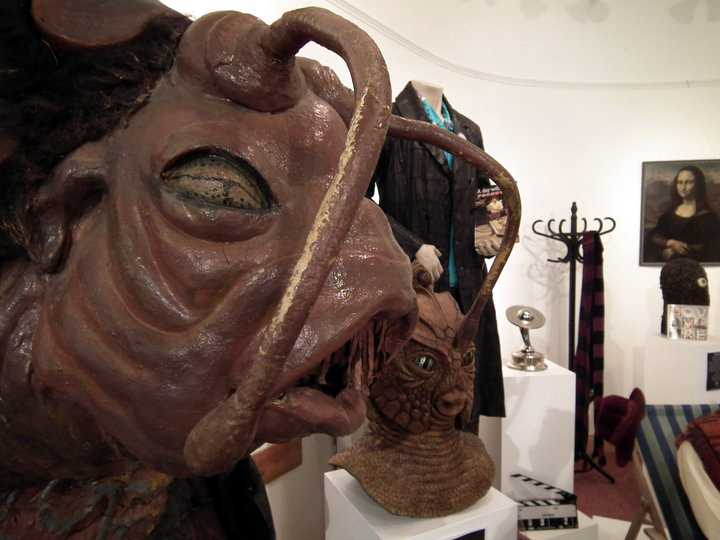 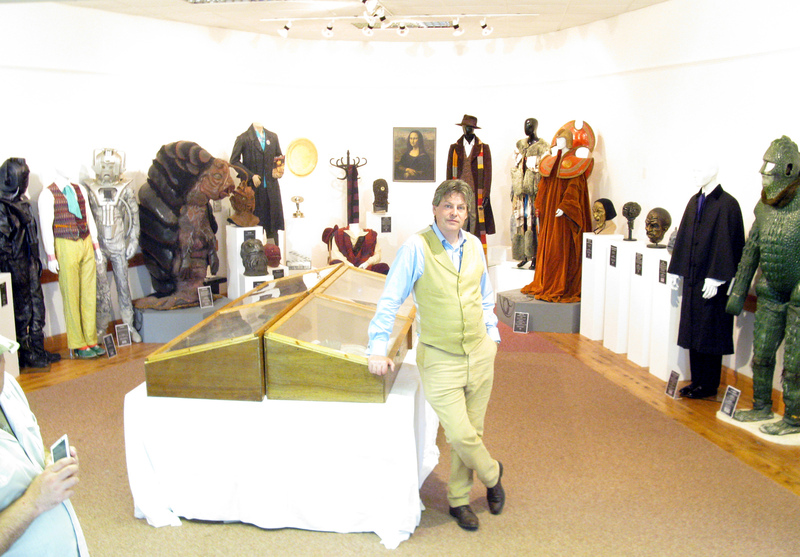 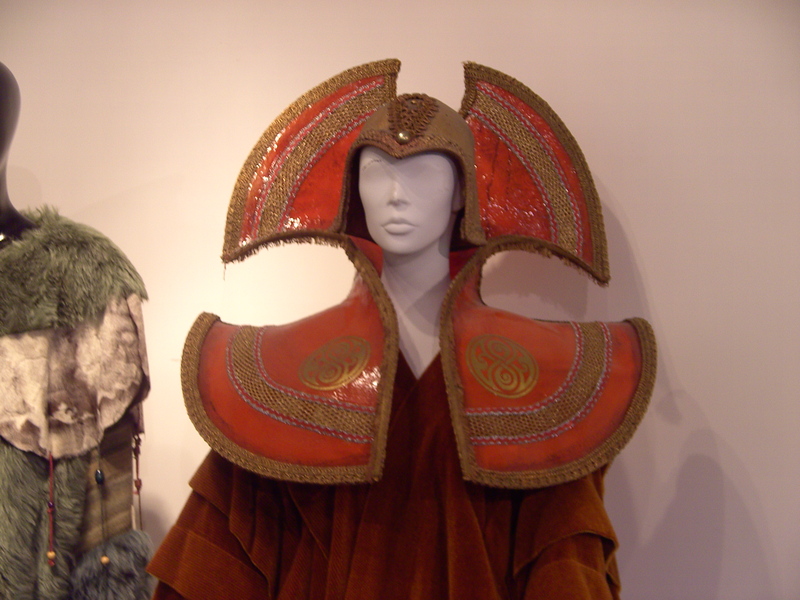 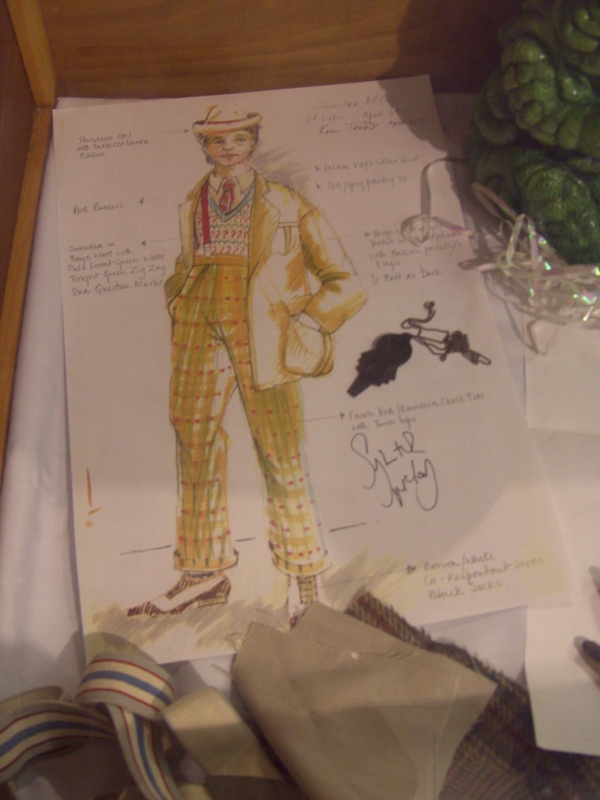 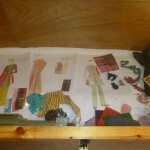 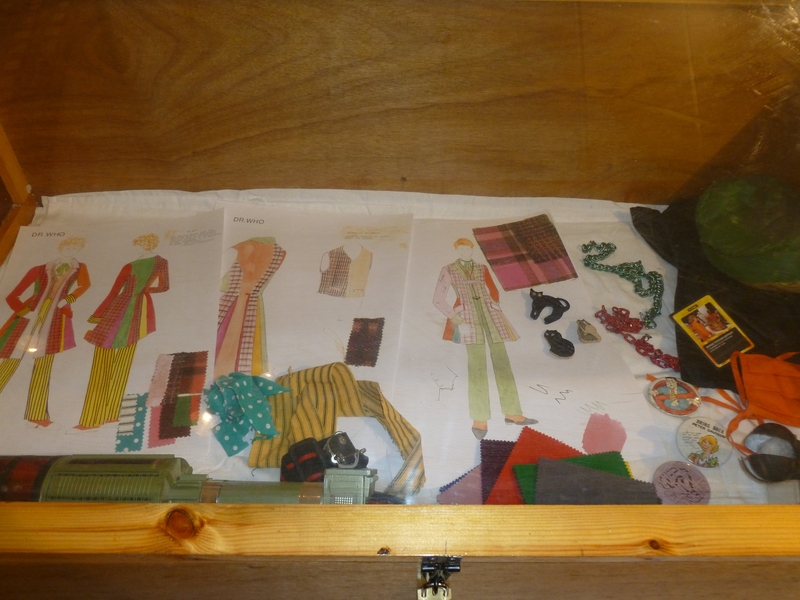 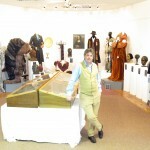 Featuring many original Monsters, Costumes, Props, Set Dressings and Design Drawings from the shows history. 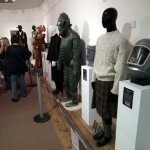 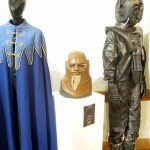 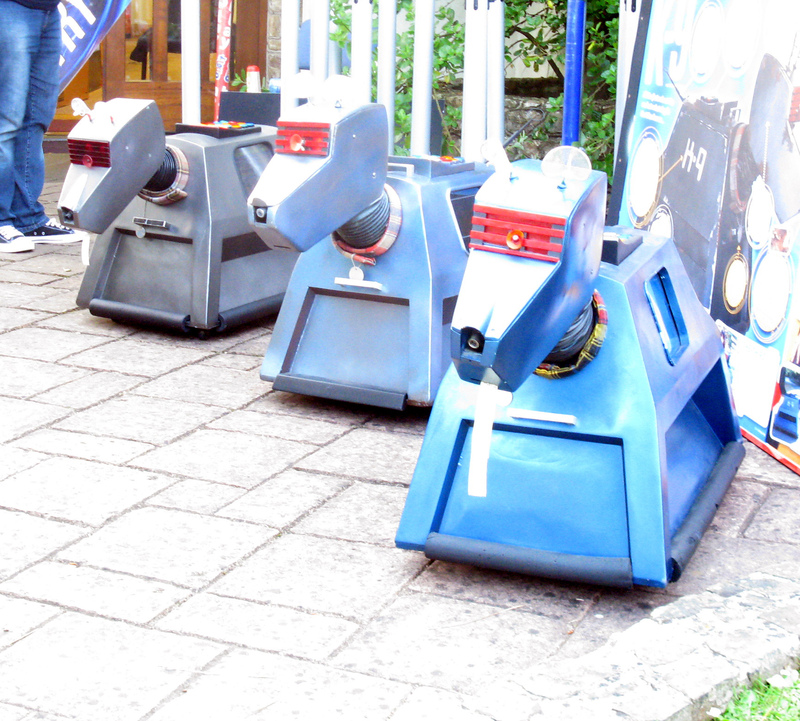 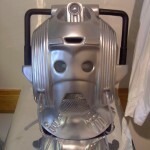 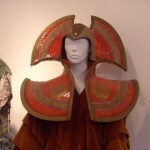 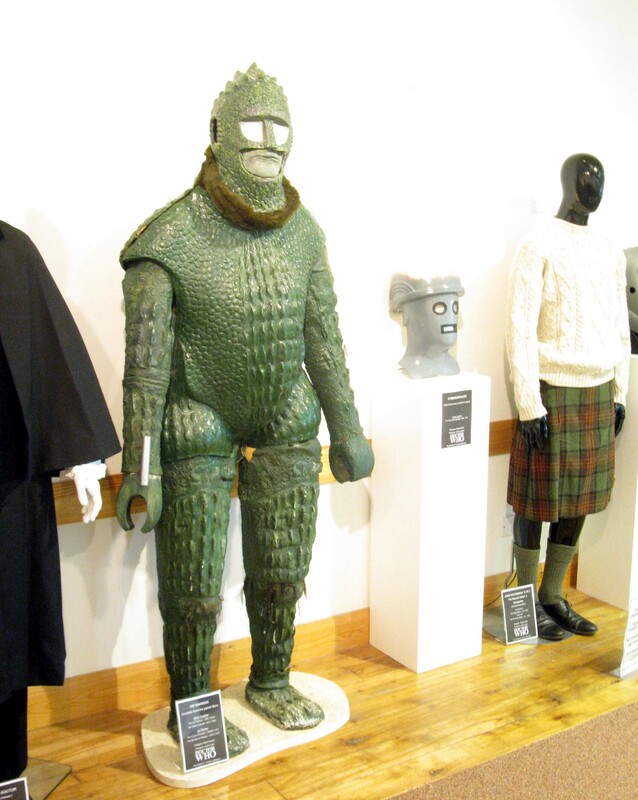 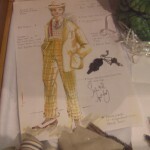 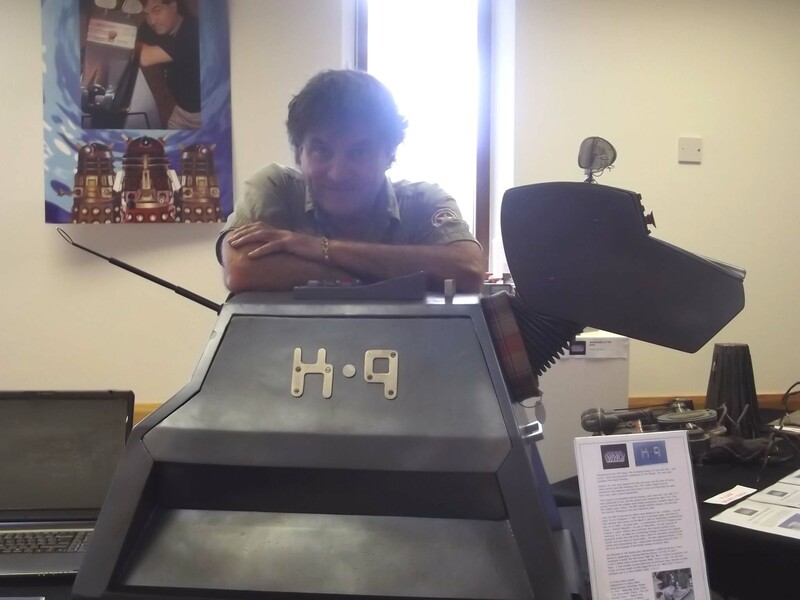 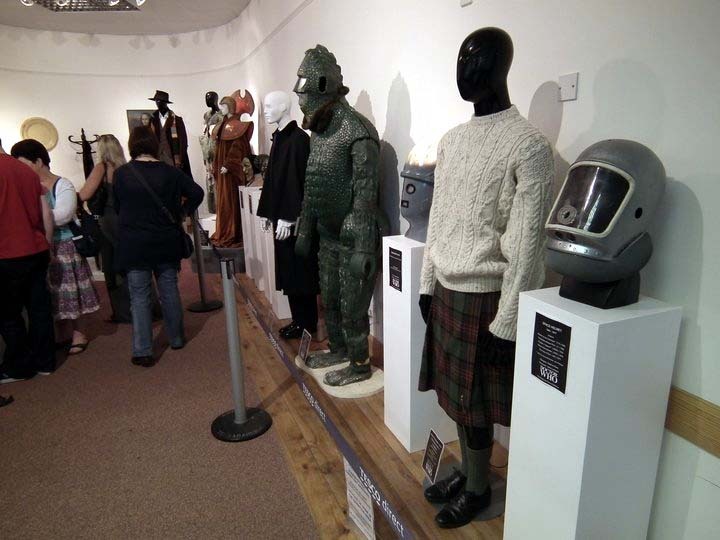 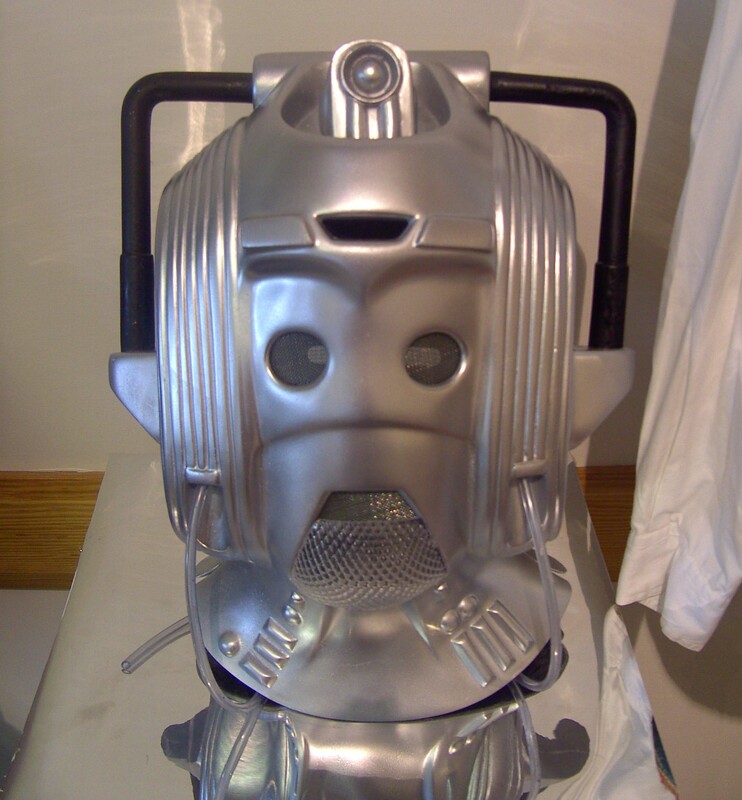 Amongst the items on display were an Ice Warrior costume, a Cybermen, 4th, 6th and 7th Doctor Costumes, head from The Tomb Of The Cybermen, some spiders from Jon Pertwee’s final story Planet Of The Spiders, the original K9 prop and many, many more. 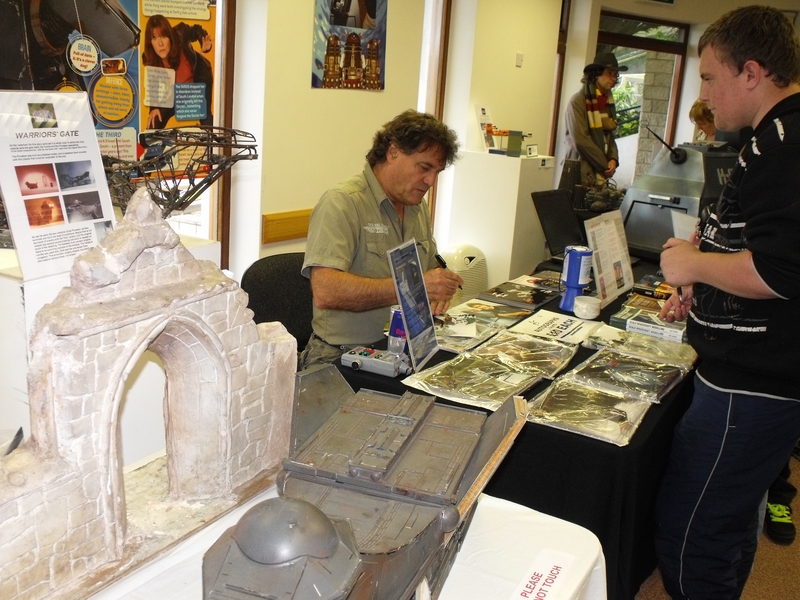 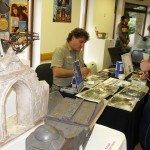 Mat Irvine was on hand to discuss all matters about models and special effects, as always he was the perfect host, with a great deal of knowledge about the series. 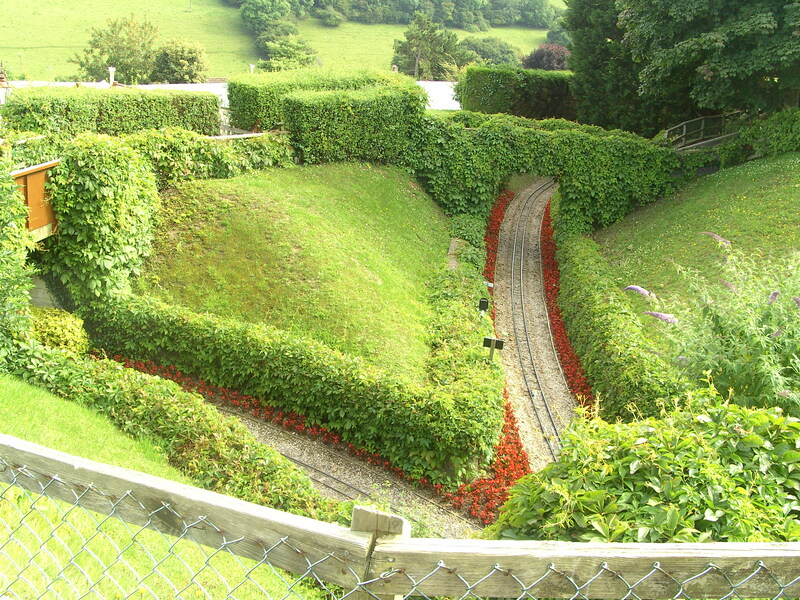 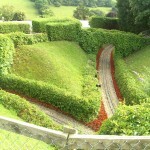 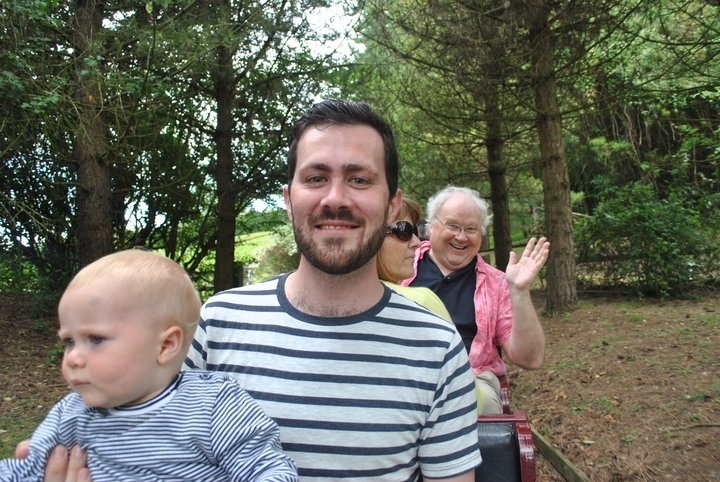 During the day there was still plenty of time to wander around the gardens, ride the steam railway, check out the many model railways on display or garb a bite to eat in the café’s or restaurant. 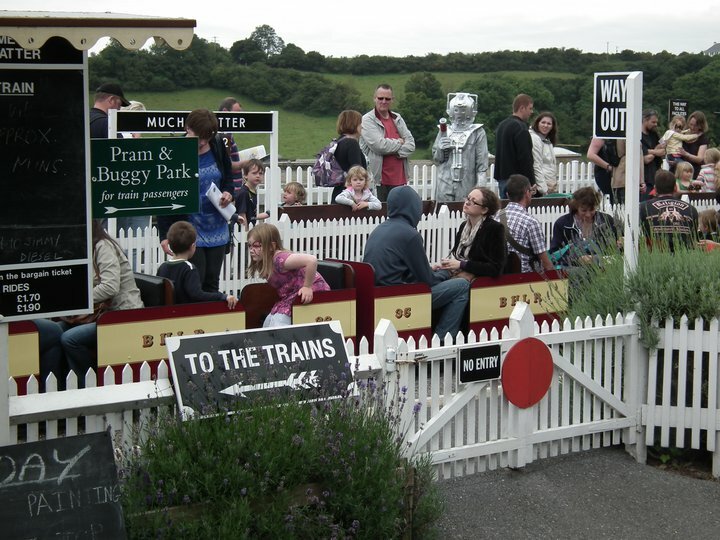 As the day drew to a close many prizes were awarded for all the various competitions, thanks and goodbyes were said and people began to make their way home. 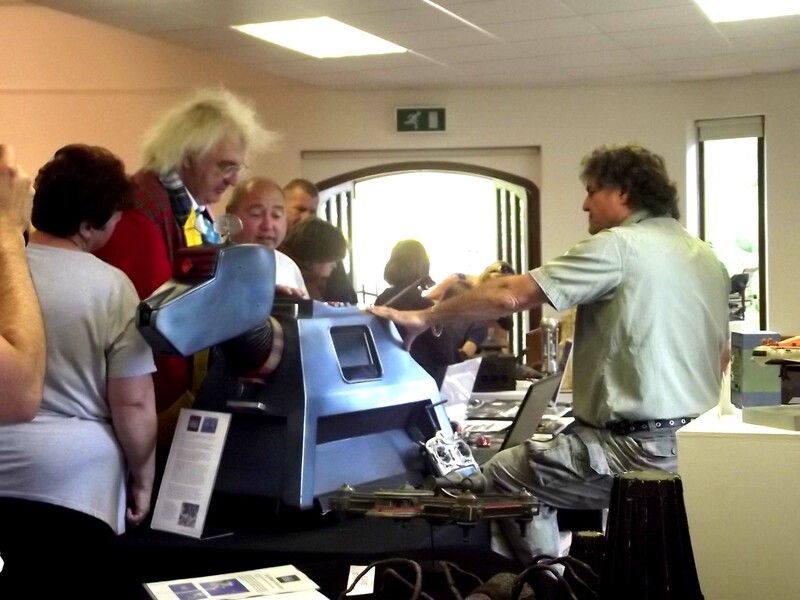 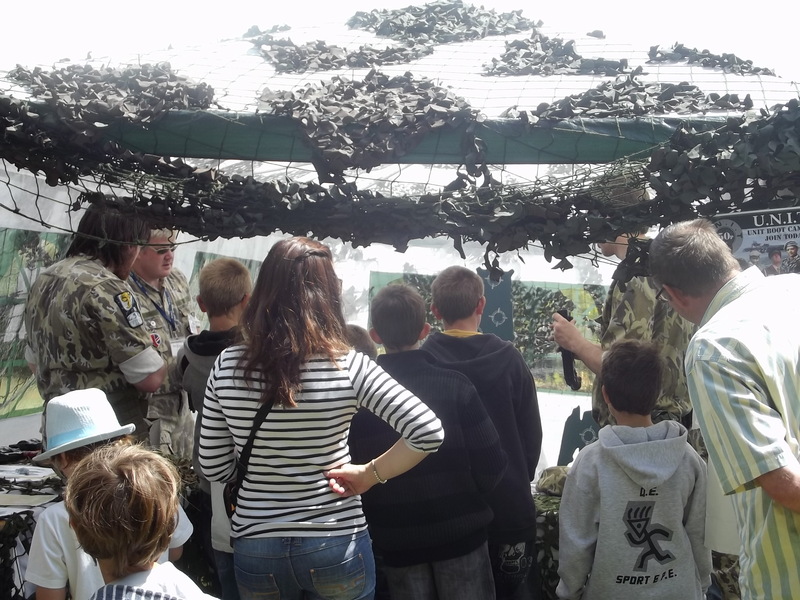 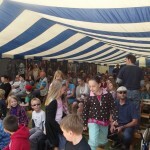 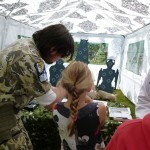 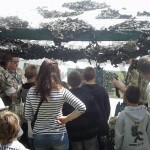 The day was a huge success, enjoyed by guests, attendees and organisers alike. 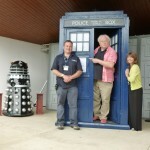 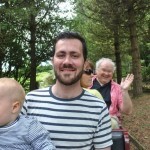 Colin, Sarah and Mat all said they had thoroughly enjoyed the day, both the attendee’s and the venue were lovely. 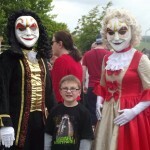 Pecorama said it was one of the busiest event days they had ever had. 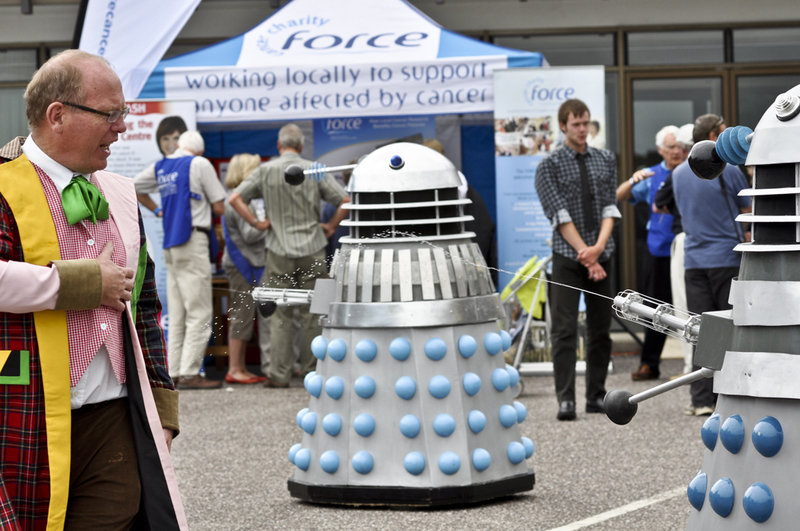 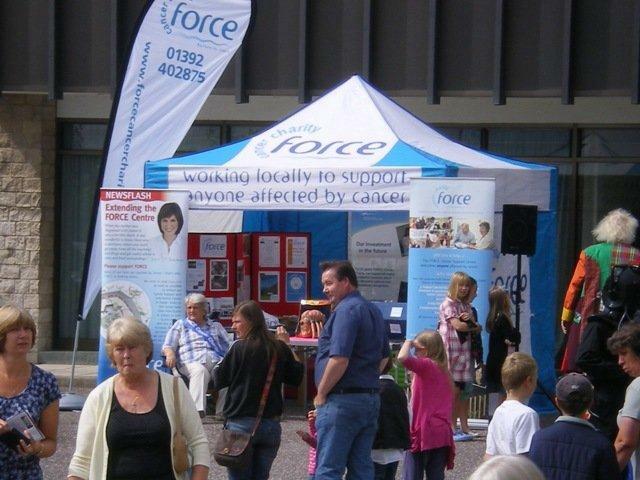 Due to the generosity of the attendee’s an amazing total of £6351.00 was raised for FORCE, a magnificent amount, thank you again to each and every one of you who supported the event.